Raymond Bernard, esotericist and writer, was Grand Master of several Western initiatic traditions (Rosicrucian, Martinist, Templar Order). By travels on every continent, by initiations received and given in the Traditions encountered in Africa, in the East and in the West, he also created spiritual and fraternal ties between many human communities, pacifying many personal quests, opening up choices at all levels of society. His written work - twelve titles, with 230,000 copies distributed together with nearly a hundred articles and messages - developed his mystical and spiritual approach. It covered the world of Tradition and its specific pathways by their attachment to a single source which he designated "the Primordial Tradition". As a Speaker, he has given hundreds of public and private conferences on these subjects, in French and English. As an Initiator, he reactivated Martinism the 1960s and established a Templar Tradition in the 1980s which also incorporated Pythagorean thought. As an Integrator, he created a bridge between African and Western Traditions and transmitted techniques giving people more independence in their individual quest. His adherence to ancient and Egyptian Traditions, to Buddhism, Hinduism, Sikhism and the Druze movement inspired his work and service. After studying law, he carried on business in his home town of Dauphine which he left at the age of 33 to begin his long journey through the Tradition, firstly to serve the Rosicrucian Order which from then began an exceptional expansion. Tradition, for him, took many forms, which he always made his own without appropriating them, being always eager to pass the torch. This site is like the notebook of a Rosicrucian, Freemason, Templar, Pythagorean, Christian, Martinist, shaman ... His latest creation, when he was 64, has been the CIRCES, still active now, conveying the essence of his message. Hundreds of events that can characterize his life of service and his work as a writer are gathered together on this site. To facilitate this exploration, it is possible to select areas and / or decades. Some events are illustrated with images, audio or video. Note: Raymond Bernard has two known namesakes; one is a film director (1891-1977) and the other is the pseudonym of a writer who signed "The Hollow Earth". 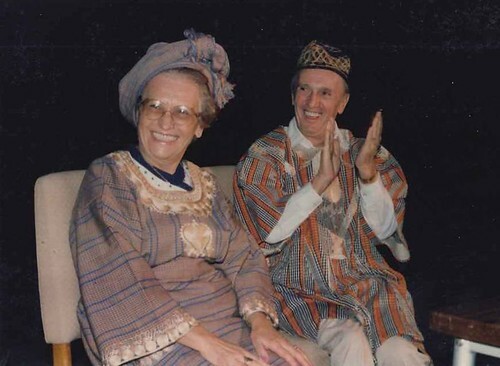 This biography presents a mozaic of the events outlining the life of Raymond Bernard (1923-2006) in the world of the Tradition, especially in Europe and Africa. He was Grand Master of the Rosicrucian Order, AMORC until 1977, Supreme Legate until 1986. He developed Martinism (TMO) in Europe in the 1960s and, in 1988, established a Templar tradition. 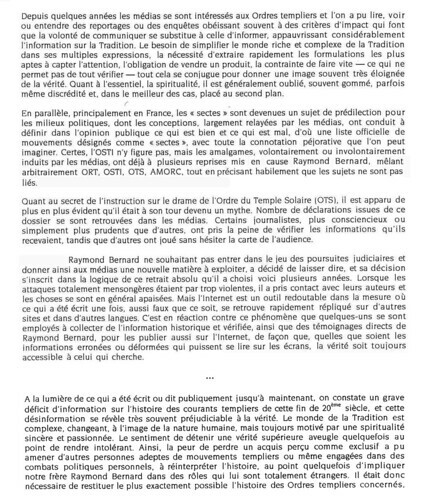 If you find an error or would like to propose a significant event, an anecdote or a memory, do not hesitate to send an email to info@raymond-bernard.net which contains all the details for the document. Until 1938, a boarder at Collège St Michel in Grenoble - now known as the private "Collège de la Salle à l'Aigle". He attempted to join the Free French Forces. Could not get further than Montpellier. Returned to Bourg d'Oisans. Edith Lynn, former director of an English College, was a refugee in Bourg d'Oisans; she introduced Raymond Bernard to the Rosicrucian Order AMORC and its teachings. She gave Raymond Bernard, for his birthday, an information booklet "The Secret Heritage" and a few copies of the Rosicrucian Digest magazine. 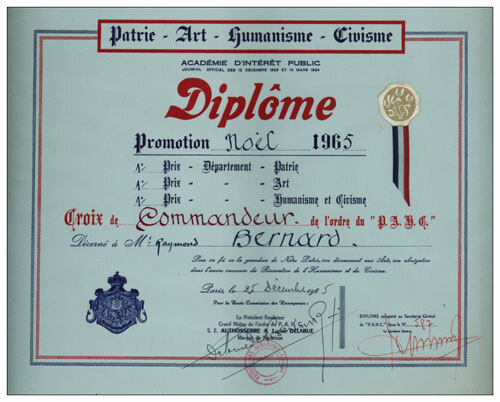 Mastering the English language, Raymond Bernard received his first lessons from 1941 to 1945. He was incorporated in the "Chantiers de Jeunesse" in the Bauges, Chatelard section, in Savoy, near his hometown. 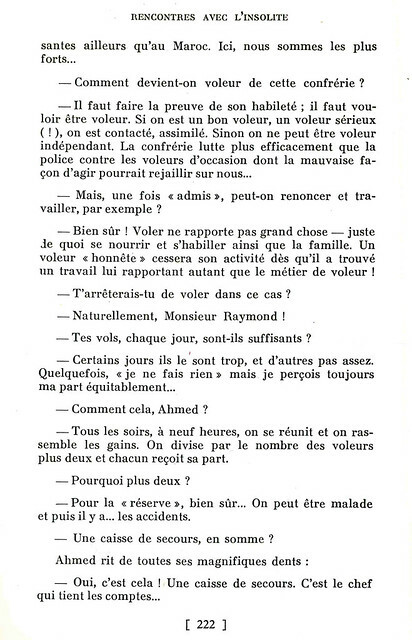 To escape the forced labour in France, Raymond Bernard took a job as a factory worker, in Rioupéroux (Isere), thanks to a friend of Russian origin. They were breaking bricks to reduce them to powder. Arrested by the Germans. His involvement in the resistance exposed the brutality of the time. He was interrogated and molested (later in the early 90s he confided that it was very painful). The landings in southern France led to his release. 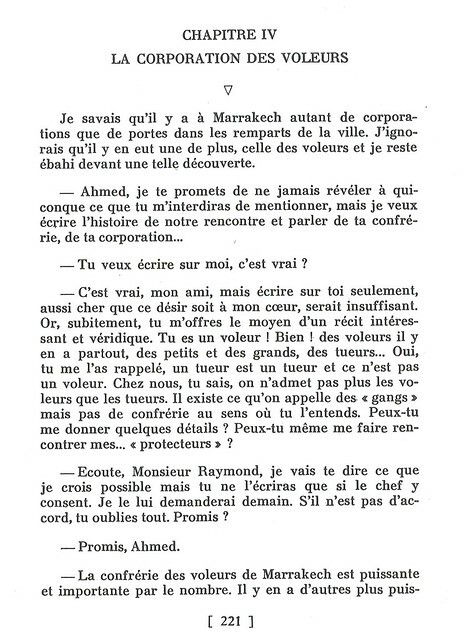 Beginning of the correspondence between Raymond Bernard and Jeanne Guesdon, then Grand Secretary of AMORC in France and member of the FUDOSI. BA (special session reserved for those who were mobilized). Mobilisation (Class 43 would be the first class mobilized). 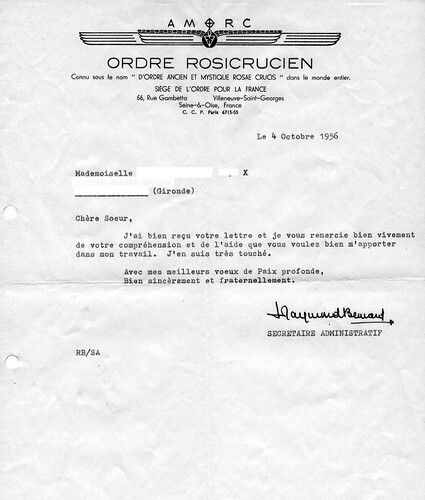 Assignment to Nimes, Artillery Training Center No. 1. Promoted to sergeant three months later. Edith Lynn left Bourg d'Oisans during this period. She gave Raymond Bernard a little book with a note: "I'm leaving, What I had to do with you is complete." University - Faculty of Law. Studied law. Enrolled in the Faculty of Grenoble, he returned to Bourg d'Oisans and continued his studies by correspondence. 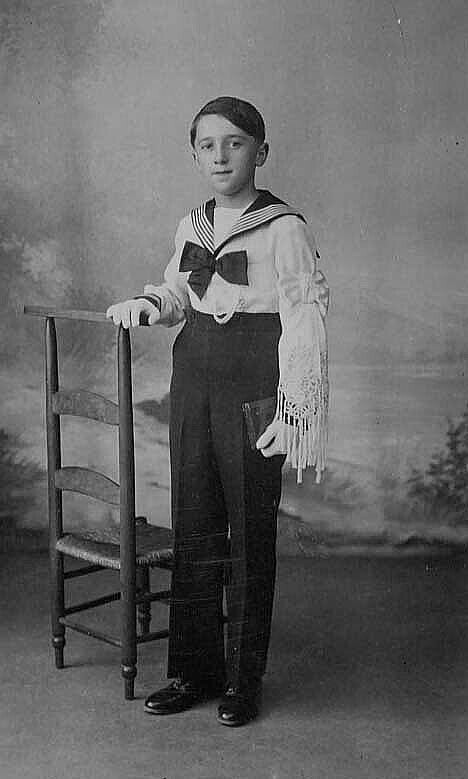 Raymond Bernard joined his brother (who had finished a three-year commitment in the Navy) to work with him and his parents in the family business. 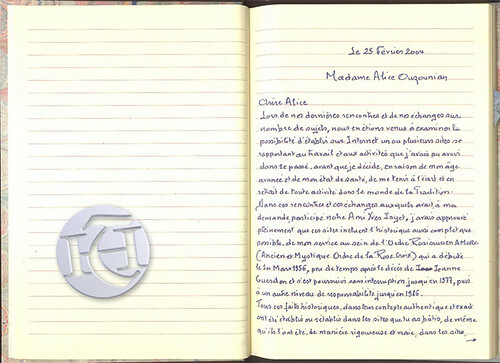 Official reactivation of AMORC in France by Jeanne Guesdon, Grand Secretary. Raymond Bernard immediately joined. He received membership No. 2 with an effective date of 1 January 1949. No. 1 was reserved for the Imperator, Ralph Lewis (the title "Imperator" refers to the global head of AMORC who chairs the supreme office, comprising five persons). Jeanne Guesdon himself remained affiliated with AMORC USA. Wedding in Bourg d'Oisans with Yvonne Noyrey. Their honeymoon took them to Corsica, then to Algiers and Oran, where he had paternal family members. Returned via Marseille. He was received within the Militia Crucifera Evangelica, an "interior order of chivalry" within AMORC (one is admitted by the decision of the Imperator). Jeanne Guesdon was officially installed in San Jose (California), the supreme seat of AMORC, in his capacity as Grand Master. Trip to Italy, enters into freemasonry. Meeting in Rome with Giuseppe di Castellammare Cassarà, who became the first Grand Master of AMORC, Italy, through whom Raymond Bernard was received as a Freemason in the Lodge of Cuori Fratelli, Rome. It was Raymond Bernard who proposed that the Imperator entrust Castellammare di Cassarà with the responsibility of awakening AMORC in Italy. Raymond Bernard also visited Grotta Ferratta. During his trip to Italy, Raymond Bernard received a Templar tradition (which was not incorporated in the usual Masonic progression). 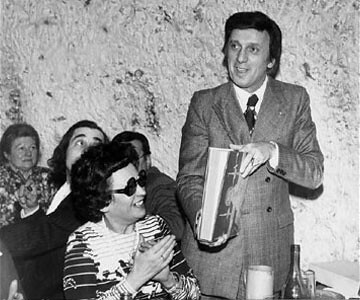 It would be revealed completely to him during a later trip to Grotta ferratta in 1968 in the Abbey of San Nilo Uniate, accompanied by V. Valerio. Note that a full and legitimate initiation recognising the perpetuation of the Templar tradition was also transmitted to him at San Jose but this was not fully materialised until 1988. 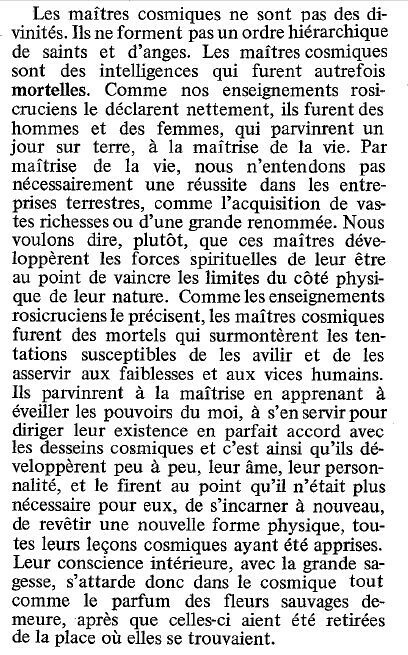 Article in the Rosicrucian Magazine No. 16 (published quarterly from AMORC, provided to the public). Created by Jeanne Guesdon in the early 1950s, it is still being circulated. 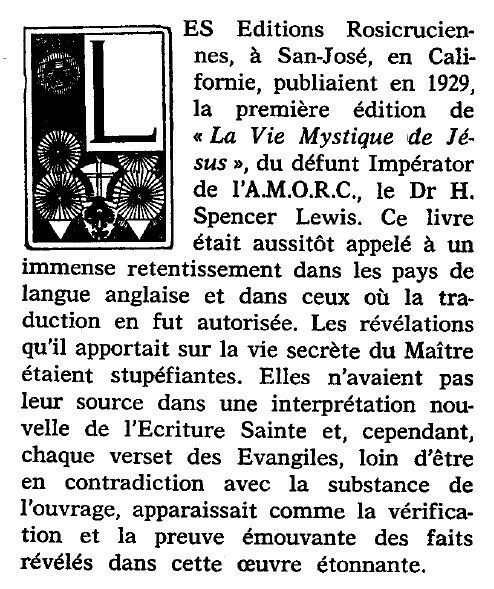 In Paris, Raymond Bernard met Ralph M. Lewis, Imperator of AMORC, who asked him to take over from Jeanne Guesdon. RML named him Administrator of AMORC on the following 1st of March. 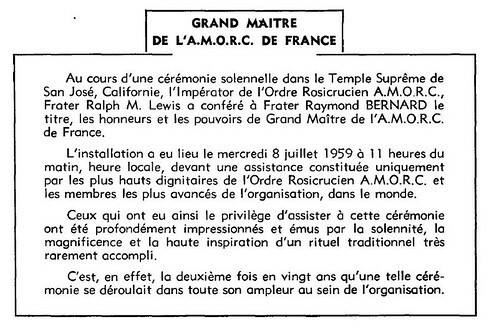 He became Grand Secretary of AMORC France, by the decision of the Imperator. The jurisdiction covered all French speaking countries and had approximately 700 members. He moved to Villeneuve-Saint-Georges, at the hotel first, then to the headquarters in the pavilion once occupied by Jeanne Guesdon. His brother having left the family business for a career in the police, Raymond Bernard also ceased his duties in the family business and went to Villeneuve-Saint-Georges. Permanent installation at Villeneuve-Saint-Georges, in the pavilion inhabited by Jeanne Guesdon where he performed the function of Grand Master. 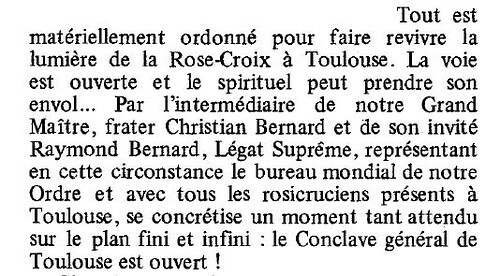 40 Rosicrucian bodies start to function within the French jurisdiction, all established on the initiative of Raymond Bernard. 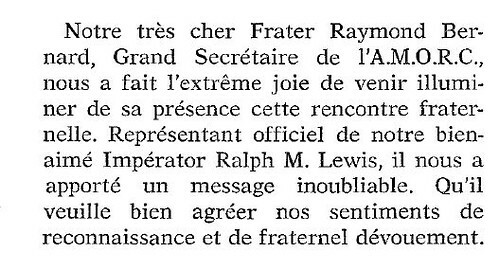 The Imperator Ralph Maxwell Lewis visited the jurisdiction of the French language for the first time September 15, 1957. The meeting took place at the Maison de la Chimie. This meeting provided a truly traditional touch within the Jeanne Guesdon Chapter. A Chapter is a local organization bringing together members of AMORC in geographical proximity, and which aims to become Lodge in order to conduct the regular rituals and initiations. This manual was developed in the USA under the direction of HS Lewis. 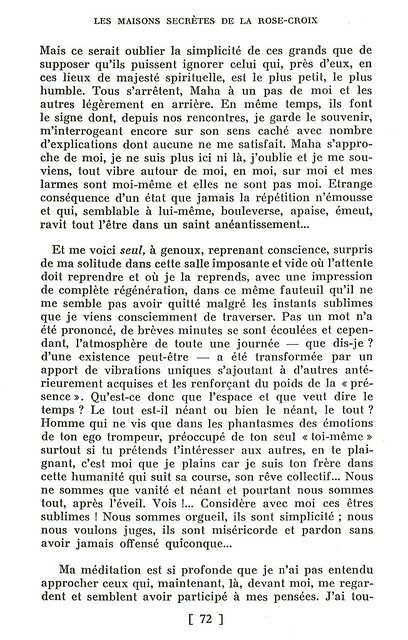 It was translated and prepared by Raymond Bernard, the first edition was issued in the form of a subscription, for a price of 1,700 francs at the time (2.60 euros). Since then there have been many updates, mostly deposited in the BNF pursuant to legal requirements. He is admitted into the Grande Loge Nationale Francaise. In 1958, he was received in a lodge of the GNLF Opera, whose brothers recognized the traditional regularity of his initiations (probably during a closed white ritual). He was then able to receive the regular initiations of that obedience. GLNF Opera was created in 1958 from the French National Grand Lodge. 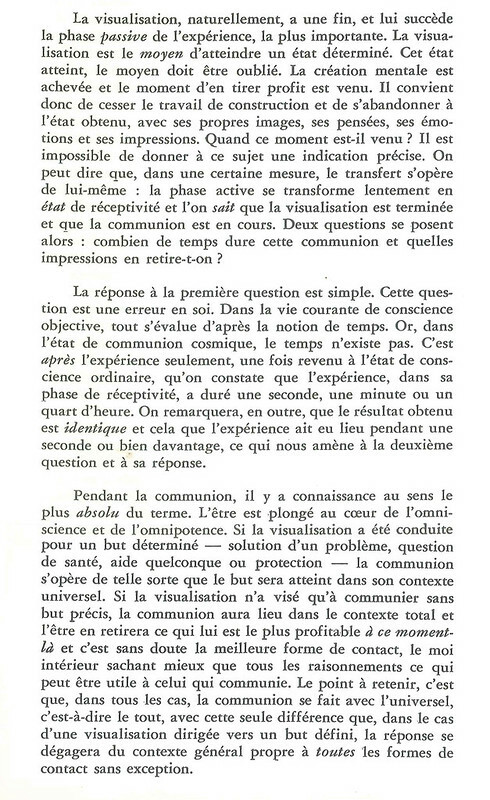 In his testimony he confided that this creation allowed an integration of more theurgic practises, (operated by Jacques Breyer in particular). In 1982 it became known as the GLTSO (Grand Lodge Symbolic and Traditional Opera). He intervened repeatedly, to deliver a message, as a representative of R.M. Lewis and to make appointments and installations in the presence of the Grand Master of Egypt, the representative of Mexico and various European countries. 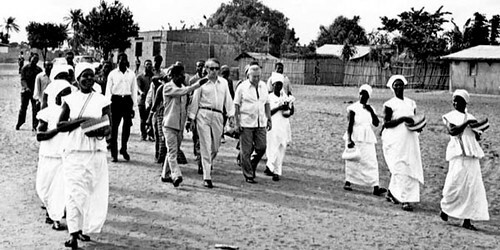 Raymond Bernard travelled to Africa. This was the first time a senior official of a traditional European organisation went to this continent. A rally is a small local conference. Some words used in this period came from the United States, and have subsequently been replaced by others. Another rally was also held in Lyon May 24, 1959. Raymond Bernard and Yvonne went to San Jose for the first time and, on July 8, Raymond Bernard was initiated and installed in the Supreme Temple, to the office of Grand Master. Following his installation as Grand Master, Raymond Bernard was duly initiated by Jess Duane Freeman, himself initiated by HS Lewis. 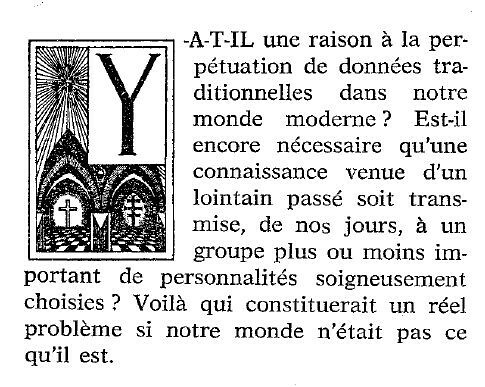 Thereafter, he would restore the TMO (Traditional Martinist Order) within AMORC France. 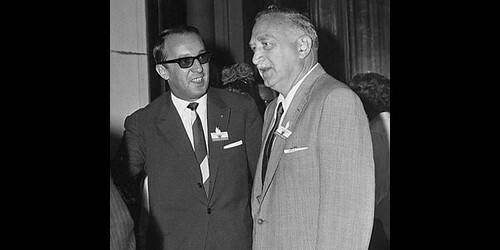 Also present at this ceremony were Yvonne Bernard and Giuseppe di Castellammare Cassarà (see 10/20/1955). 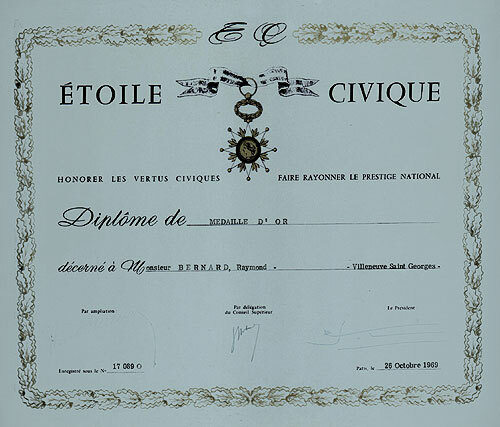 He received the rank of Apprentice in the GLNF Opera (created from the French National Grand Lodge). 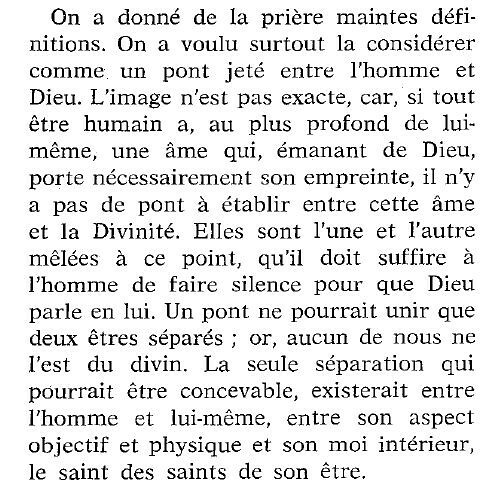 In his testimony he confided that this creation permitted a more integrated theurgic practice (as operated by Jacques Breyer in particular). Raymond Bernard received the three Martinist Initiation degrees, as well as that of Initiator, from Marcel Laperruque, Deputy Grand Master of the branch of Robert Ambelain. It was an exchange of initiations. 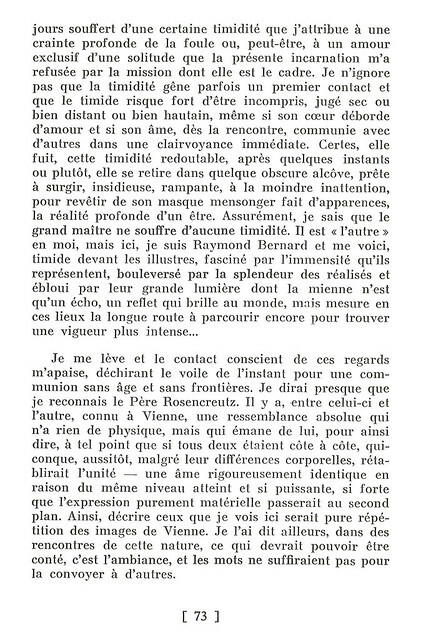 Raymond Bernard then met Robert Ambelain in a café near the Madeleine church, receiving thereby confirmation of the regularity of his initiations and of the Martinism he perpetuated. Masonic Reception to the rank of Fellowcraft Mason. International Convention in San Jose July 10-15, reported in the Rosicrucian Review No. 35. At the Hotel du Rhone, until October 2, Geneva, on the initiative of Raymond Bernard. Theme: "The Rose + Croix in the modern world"
This is a regional function within AMORC. Independently, Marcel Laperruque organised a Martinist tradition. It included among other things : a committee of Rosicrucian traditional and historical research and a committee of Rosicrucian scientific research, other main branches could be established later. From February 7 to 13, invited by the Chapter Nova Atlantis. He met Lucien Metche, then master of the Lodge. 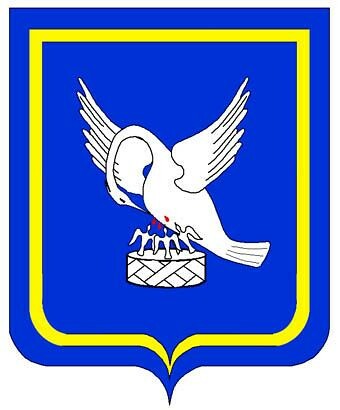 The latter eventually joined the ORT in 1970, then moved on in 1972 to create the OVDT in 1973. In February 1962, he founded the Cultural Institute of Children, and in the same month, for the first time offered the brochure "Education". The success of this Institute was immediate. In March 1962. Many appointments and the creation of a single initiation team for the two Congos (the team conducts initiations when there is not yet a Lodge). Masonic Reception to the grade of Master Mason. But Raymond Bernard, being heavily involved with his Rosicrucian duties, soon ended his participation in the work of the Masonic Lodge. Article in the Rosicrucian Review No. 42. "... Certainly, a good book is a valuable support on the path. It is always an encouragement and, if it is particularly inspired, it can help open the objective consciousness - if already accustomed to spiritual exercises - to the flow of the highest cosmic vibrations, by creating, in the heart of the sincere seeker, a void, a need, a call. But a book can only be a companion, it will never create a person's evolution in his/her being." 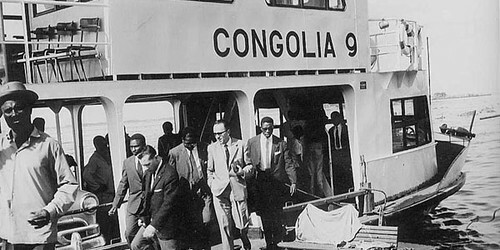 He first went to Brazzaville (former French Congo), then crossed the river Congo to get to Leopoldville (Kinshasa, formerly Belgian Congo) and then attended the conference organized in Bakwanga in Southern Kasai, in July 1962. He had long interviews with HM Chief Kalonji of South Kasai. The reception of the Rosicrucians and the political authorities was marked by respect, affection and hospitality. The Imperator was also present. Organized by the Grand Lodge for the French-speaking countries for its members. Thirteen days in January 1963 were planned to provide sufficient time for a visit as complete as possible. The trip had for its official guide a Rosicrucian, an Egyptologist at the Ecole du Louvre and project leader at the Museum of National Antiquities. 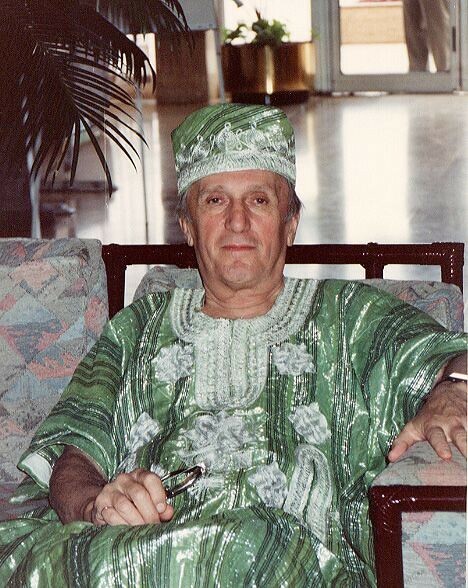 In July 1963, Raymond Bernard, as Grand Master, visited Haiti for the first time. A meeting was held at the Lodge. He was accompanied by the Grand Councillor for Switzerland. Elevation of a Chapter to the status of Lodge; nomination of a Grand Councillor for Dahomey. From 6th to 6th March. 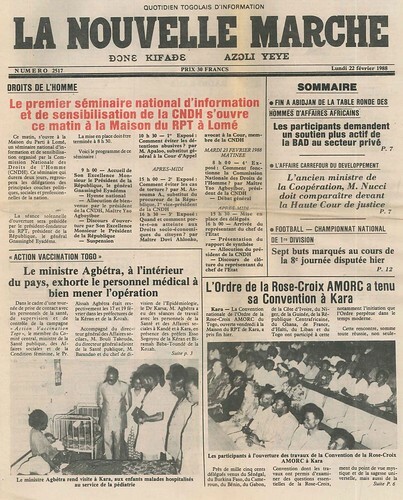 The first national Convention at Lomé was held. In the Monthly Bulletin for June one could read : "Raymond Bernard just been given the honour of an officer of Civic Merit award with the silver medal (the award was given at the end of May during a ceremony presided over by General Legentilhomme ). " The Imperator acknowledged the considerable development within the French jurisdiction directed by Raymond Bernard. It became the largest in Europe and the second in the world. At the instigation of Raymond Bernard, from the 4th to 6th September, in the presence of the Imperator. 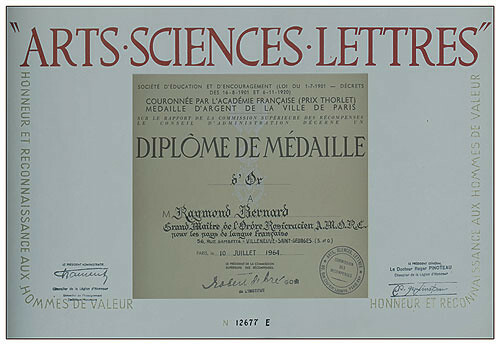 Raymond Bernard Lewis and Ralph were given the cravat of Commander of Merit and the French National Gold Medal of Arts, Sciences and Letters. United Kingdom Convention in London, 12-13 September, in the presence of the Imperator. From March 14 to 29, where he directed initiation ceremonies. The ritual had been instigated by H.S. Lewis, the first Imperator. Decreed by R.M. Lewis and implemented by Raymond Bernard, it led to the removal of all functions of the Grand Lodge except Grand Master, who then took direct supervision of all subordinate bodies, and the removal of the Consistory and the Advisory Committee of Wise Men (which became the Court of Arbitration and Justice). R.M. Lewis and Raymond Bernard were awarded the distinction of "Commander of the Order of P.A.H.C." 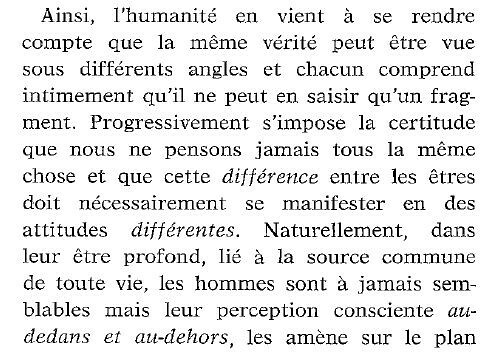 (Patrie, Art, Humanisme, Civisme). 23rd and 24th April. He delivered a lecture. Following the death of Martha Lewis, widow of the first Imperator, the Supreme Board of AMORC, San Jose (California), at its meeting of August 4, elected Raymond Bernard as a Board Member, and assigned him the function of Supreme Legate. While returning from a trip to Israel and Jordan, he stopped in Beirut, hosted by Justice Minister Fouad Rizk. The latter introduced him to Kamal Jumblatt, the Druze leader, founder of the PSP. Deep spiritual affinities lead to spiritual friendship between the two men. 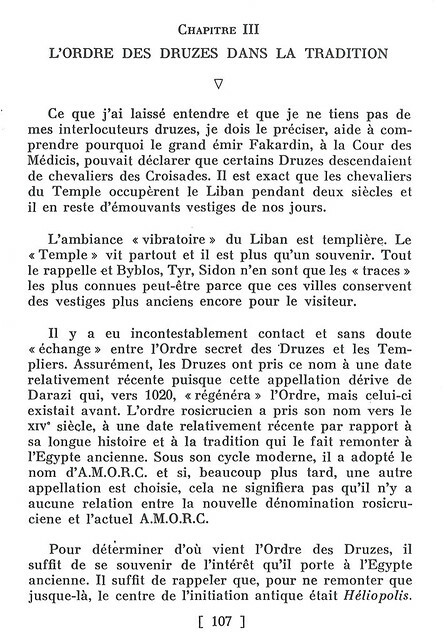 "Meetings with a secret order: The Druzes"
First release (a private edition) of the account; subsequently made public by Editions Rosicruciennes early 1970. It was already decorated with the silver. This inoguration indluded the installation of a Grand Master (jurisdictions are by language : one Grand Master per language). The conclave was honoured by the presence of the Imperator and his wife, Gladys. "Secret Houses of the Rose+Croix"
From 7th to 12th July. Raymond Bernard conducted the first French language convocation in the Supreme Temple. 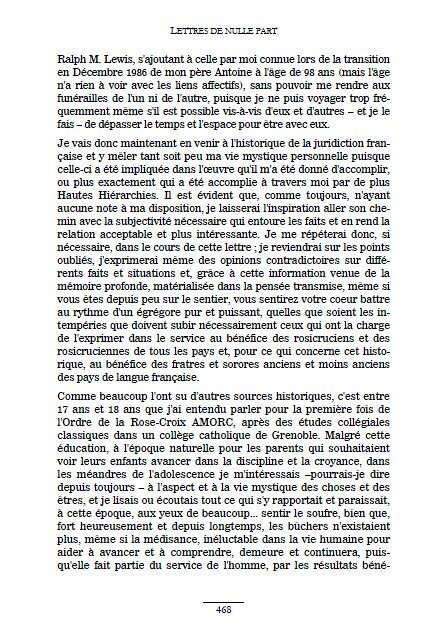 One can find the original text, posted at his request in 2004, the site : http://www.tradition mystique.net or directly via the link below:. "Ahmed, the Guild of Thieves"
Appointed to the National Council for Promotion, Pierre Crimetz would later deal specifically with Martinism. 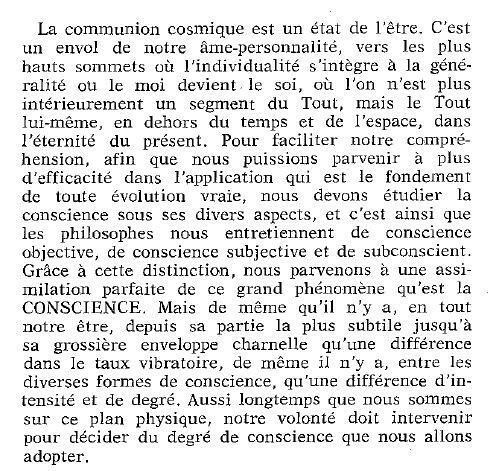 First release of the story "Cosmic Initiation - Messages from the Cathedral of the Soul", a private edition, this was made public by Editions Rosicruciennes early 1970. 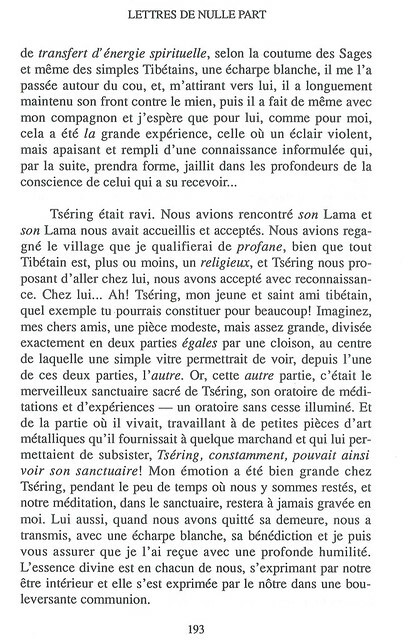 First release of the narrative "Strange Encounters" (private edition), subsequently made public by Editions Rosicruciennes, early in 1976. This chateau is located in Normandy, the premises of Villeneuve Saint Georges had become too cramped. The chateau was restored and fitted out to accomodate the services of the Grand Lodge. The move became effective in 1971. 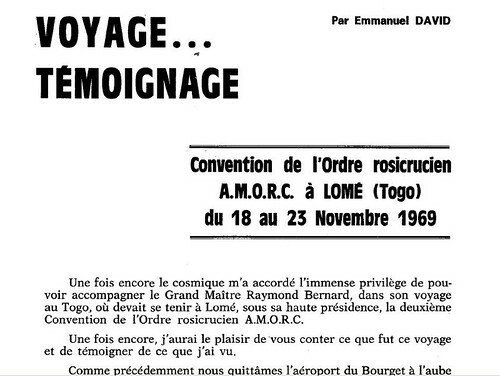 From 18th to 23rd November, he went to Lomé in Togo for a Rosicrucian convention.He was accompanied by Emmanuel David. 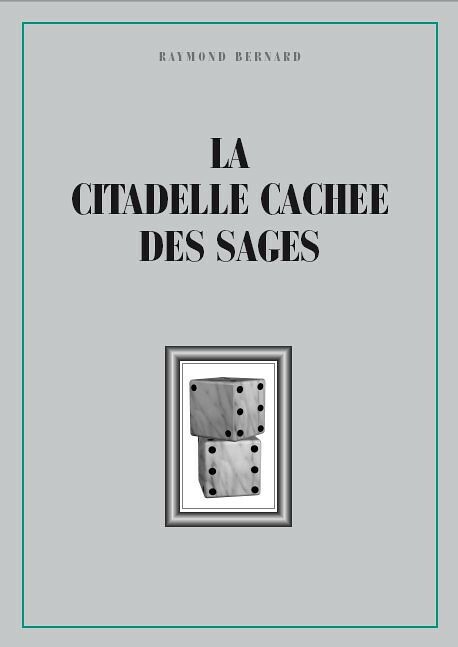 "Messages from the Celestial Sanctum"
"The Secret Houses of the Rose-Croix"
The first was in April 1967, after Benin (see 2/4/1969). From 1st to 5th July, as the Supreme Legate, he visited Haiti once again and initiated the first Haitian members of the Martinist Order. On this occasion, he conducted a special Experience for which he had two authorizations, having already performed it at the Jeanne Guesdon Lodge in Paris. He was accompanied by Fr V. Valerio, Italy. 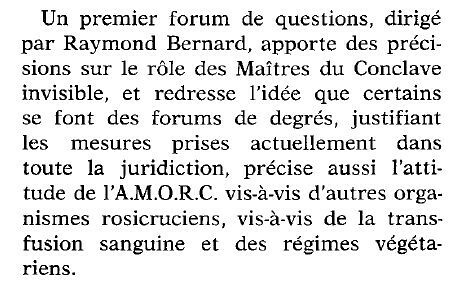 With the endorsement of Ralph M. Lewis, Raymond Bernard founded the ORT (Renovated Order of the Temple) as an Association of the Law 1901, registered in Mantes-la-Jolie (Yvelines, France), published in J.O. on 17/11/1970. He wrote a series of talks on the Greek tradition and Pythagoreanism, the last three on a study of the fundamental texts of the mystics in India. These were to serve as a basis for written teaching within the framework of a Pythagorean "Path", which had no immediate operative expression in this form but was later incorporated into the OSTI. 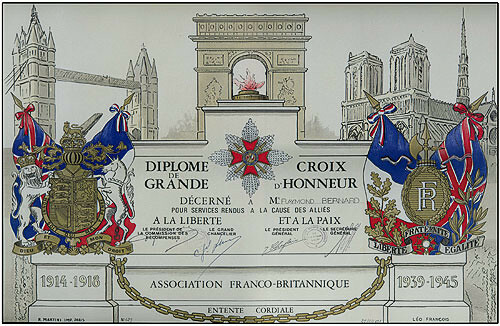 He is awarded the Grand Cross of Honour of the Franco-British Association. Raymond Bernard relinquished the chairmanship of the ORT. He was replaced in this function by J. Origas, Grand Seneschal of the Order, who became its Grand Master. Ivory Coast. Creation of the O.S.A.T.A. This was his 3rd visit to the Ivory Coast. He participated in the first National Convention of AMORC 8th, 9th and 10th October 1971. He also created the O.S.A.T.A. : Ancient and Secret Order of African Traditions. The objective of the O.S.A.T.A. was : to fight efffectively against the forces of witchcraft, sorcery and black magic that could disrupt some members in their quest for light. For nearly 30 years, the O.S.A.T.A. helped many Africans in this regard and with great efficiency. Raymond Bernard terminated the activities of the order permanently some time later. Raymond Bernard retired from the Board of the ORT and all activities within that movement, to devote himself exclusively to his new post of Grand Master and Supreme Legate. He left the entire burden of the conduct and destinies of the ORT to Julien Origas. He kept a contact through correspondence counselling with J. Origas. 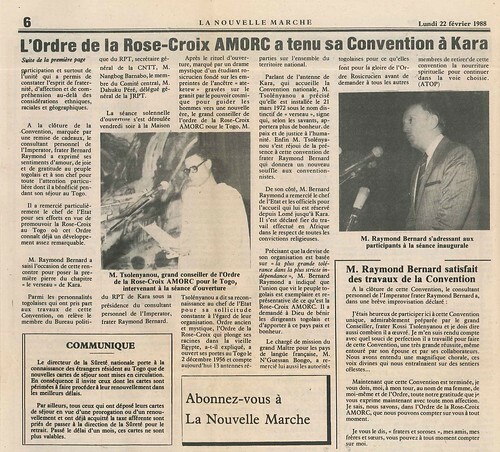 Raymond Bernard conducts the Rosicrucian wedding ceremony of his son Christian with Hélène Lefort. This event is reported by the Belgian daily newspaper Le Soir in the February 6th and 7th edition. He invites the dignitaries of the OM to an OMT Conventicle. 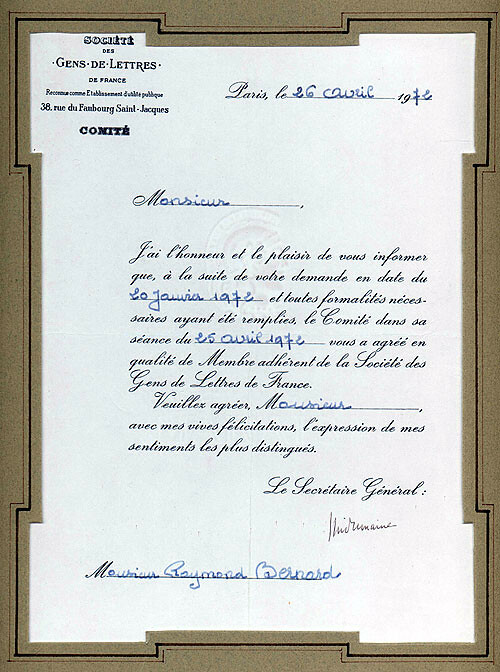 Raymond Bernard,then Grand Master of the TMO, decided to give a fraternal invitation to the Martinist Order of Papus, which was then represented by its dignitaries(at that time Irénée S : Grand Master and Philippe Encausse :Honorary Grand Master) . 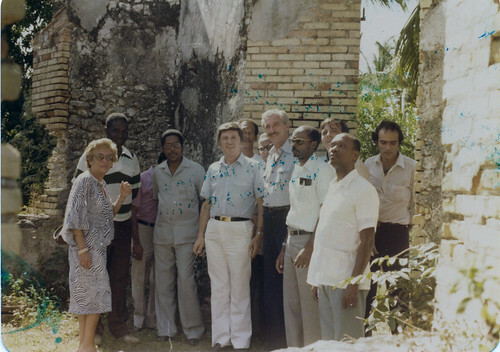 This meeting took place in la Maison des ingénieurs, rue Jean Goujon, and the review L'Initiation January-February-March 1972 indicates that there were many participants. Article in the Rosicrucian Review No. 81 (inside back cover). Article in the Rosicrucian Review No. 81. J. Origas, Grand Master of the ORT. Article in the Rosicrucian Review No. 82. He went to the 20th anniversary of the Pasqually Martinez Lodge, accompanied by his wife Yvonne, the Grand Secretary for France, himself accompanied by his wife, and his stepmother, Grand Counsellor for Northern France. 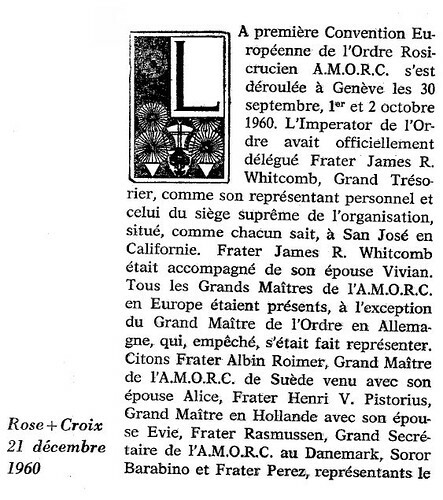 As Supreme Legate and Grand Master of the Rosicrucian Order AMORC, he unveiled a plaque to announce the expansion work of the Lodge and raised two brothers, including the President of the Republic, to the rank of Knights Rose-Croix . 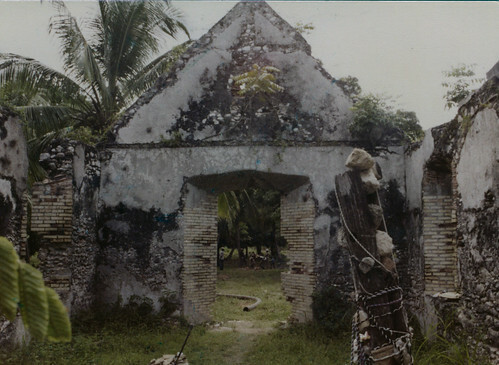 He also went to Leogane, where the temple of Pasqually Martinez is situated. Article in the Rosicrucian Review No. 83. Raymond Bernard resigned from the ORT. Any link between AMORC and the ORT was officially and permanently severed. There would be no further correspondence or other relationship with the ORT. Completed by a Magisterial Seminar. 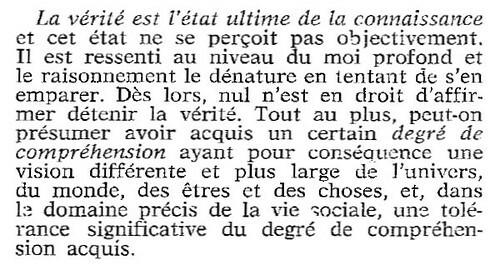 Because some Rosicrucians were recruiting among the members of their Order into other organizations, including the Temple, Raymond Bernard isued a Magisterial Edict which clarified the position, loyalty and commitment of each responsible member vis-à-vis AMORC. This clarification was intended to stop dissidents disrupting the work of the various Organisations. 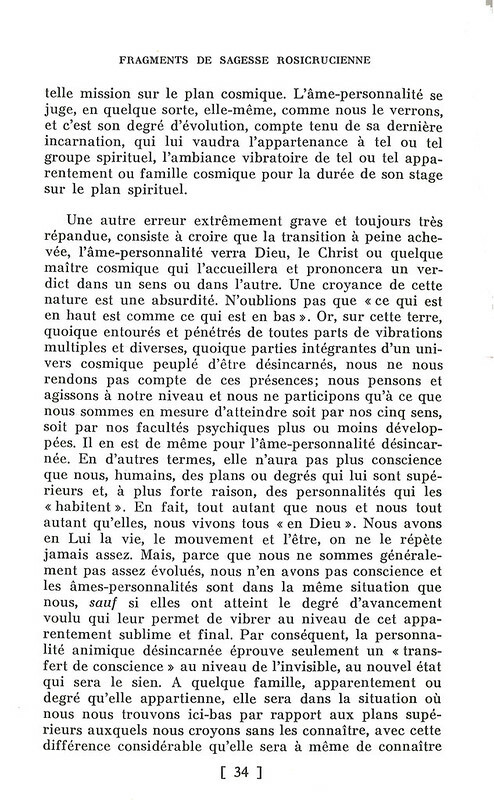 It also clarified his own position, stating unequivocally that he had no function, secret or not, other than that which he fulfilled within AMORC. Article in the Rosicrucian Review No. 84. "New Messages from the Clelestial Sanctum"
Article in the Rosicrucian Review No. 85. Article in the Rosicrucian Review No. 87. Article in the Rosicrucian Review No. 90. Article in the Rosicrucian Review No. 91. Article in the Rosicrucian Review No. 92. He met with the town Mayor (see Secret Rendez vous in Rome, the book in which he recounts his initiation into the Templar Tradition in Grotta Ferrata). From March 11th to 14th, as Supreme Legate, he inaugurated the Auditorium of the Lodge and devoted two days to receive almost all the members, more than 200 in number, in private meetings. For many years Raymond Bernard, in his capacity of Grand Master, had envisaged a place of mystical meditation and retreat. This place took form through the purchase of a medieval chateau, surrounded by a five-hectare park, about 20 kilometers from Lyon, which the Order had with effect from 5 November 1975. It was called "The Chateau of Silence" and was devoted exclusively to meditation. Members who wished so could stay for a period of three, five, seven or ten days each. The project was made possible thanks to the support of Juliette G., who was the Superintendent, resident there permanently. The brief but strict rules, set by Raymond Bernard for this centre, were based on simplicity, austerity and silence. Several daily group meditations took place in various rooms devoted to this work. In the "High Chamber", members on mystical retreat would, in turn, maintain a service of meditation for 24 hours a day. Silence was a requirement except at certain very specific times. Individual work was also encouraged, with each retreat member having a cell. The Imperator who visited the area in August with the Grand Master, said that this "jewel" would benefit members worldwide. 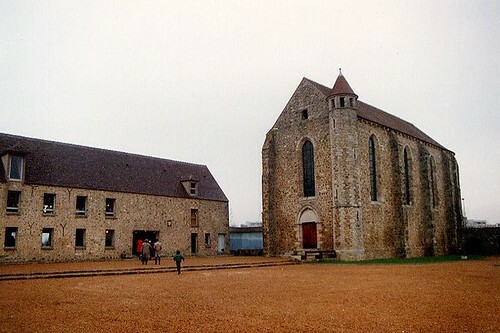 The activities of the Chateau of Silence were scheduled to begin on 1 February 1976. The Castle would host a large number of members for several years. 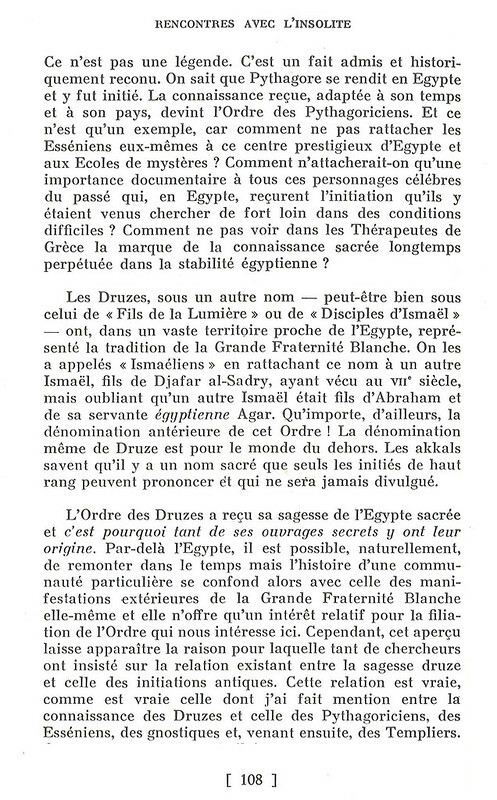 The first ritualization of the mysticism that later would become the basis of the Templar ritual was held in the Great Pyramid, during an initiatory journey organized within the framework of AMORC. He repeated this once again in the Great Pyramid, the following year. 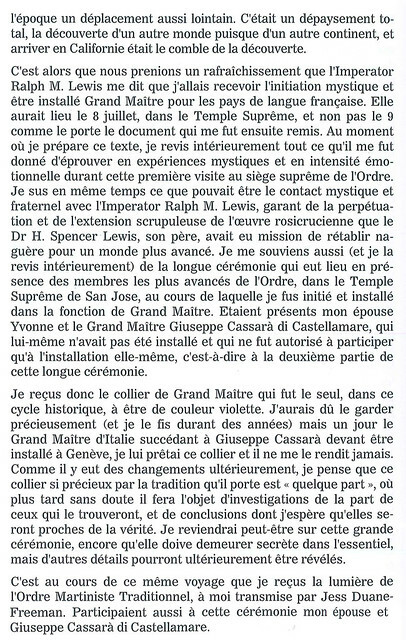 21 years after he settled in Villeneuve-Saint-Georges, being anxious to make way for a new generation in the conduct of spiritual movements, he announced to the Supreme Grand Lodge his wish to retire as Grand Master while continuing to assume his position of worldwide Supreme Legate. The national French had by then increased from about 700 members in 1956 to between 38- and 39- thousand members. It ran from August 4th to 7th. Raymond Bernard had resigned his office of Grand Master. By decision of the Supreme Grand Lodge, Christian Bernard was appointed to succeed him. 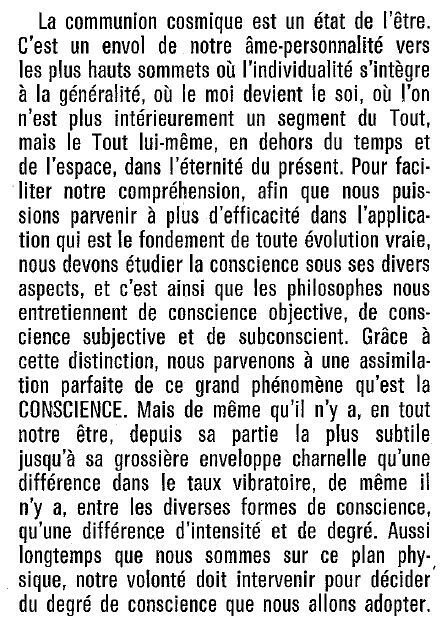 He was thereby installed as fourth Grand Master of AMORC (for the French language jurisdiction) on Sunday, August 7th, 1977. 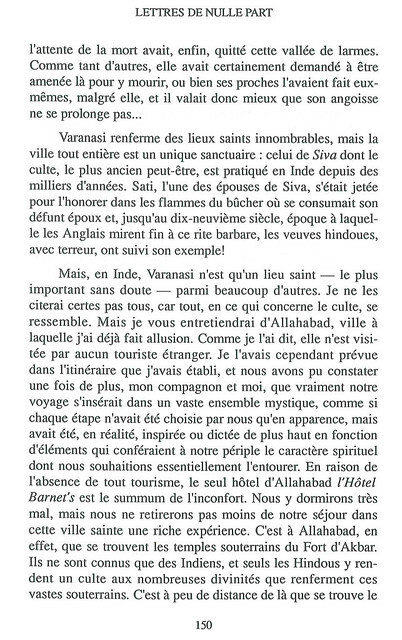 Accompanied by Jean-Marc A., he began a journey which led from North to South, including Kashmir, Sikkim, Trivandrum, Varanasi, Dharamsala, etc.. He had many meetings and spent several stays in ashrams. He experienced a myocardial infarction, he was hospitalized in Normandy and was convalescing for several months. An explanatory article in the Rosicrucian Review, No. 106. He defined Egregor as follows: "The combination of both terrestrial and supra-terrestrial entities to form a unified hierarchy moved by a compelling idea" and went on to develop the application of this concept. At the Palais des Congres, Porte Maillot. Pierre Crimetz , in charge of OMT, stepped down to create the "Ordre des Chevaliers Martinistes"; this was an amicable separation with Raymond Bernard who invited everyone to continue with respect and tolerance. 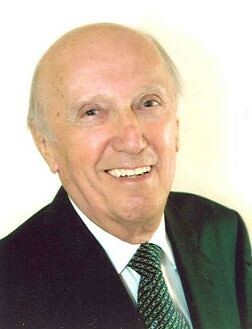 Pierre Crimetz, born in 1932, died on 23rd of november 2012. From 28th to 31st May, for French-speaking countries. 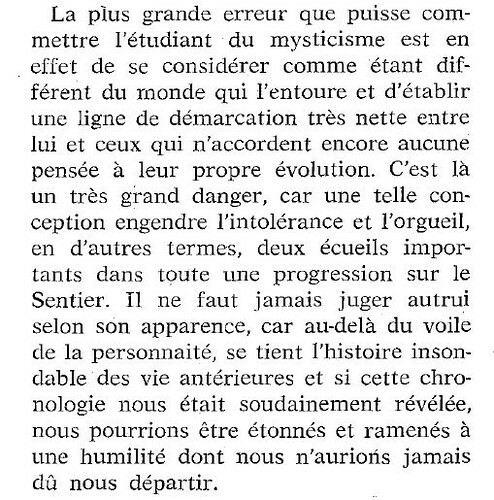 Raymond Bernard was invited onto "Dossiers de l’Ecran" on Antenne 2, on the theme of Cagliostro, with Philippe Encausse, Antoine Faivre and Robert Amadou. Invited to the World Convention at Wembley (UK). 28th and 29th November, chaired by the Grand Master (Christian Bernard): Guest of Honour, Raymond Bernard, Supreme Legate, who chaired two of the four Conventicles. 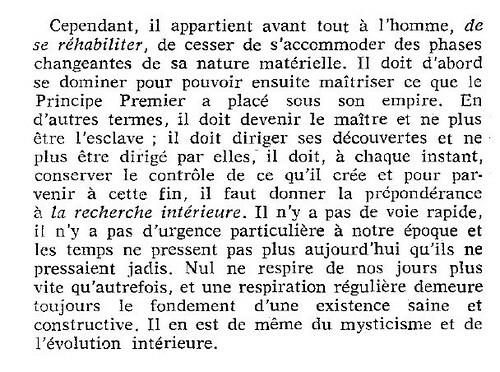 Serge Caillet, historian of occultism talked with Raymond Bernard about the Rosicrucian Order. 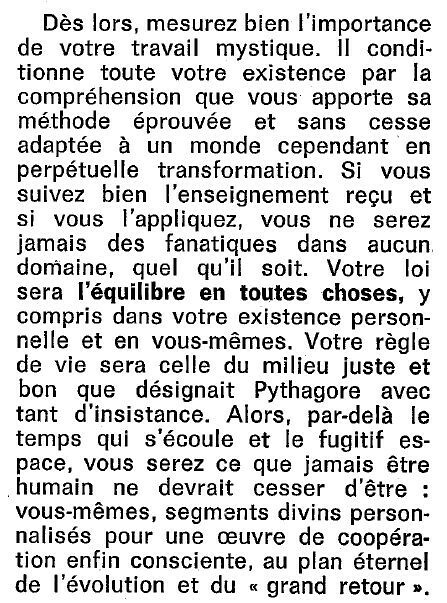 This interview - entirely recorded - took place in Paris at the Cultural Center of the Rosicrucian AMORC, and was published as The Rosicrucian Order , by Editions rosicruciennes in 1983 . 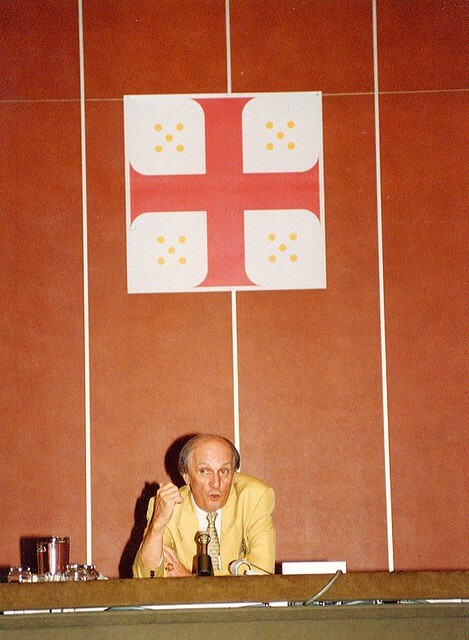 He hosted a series of seminars entitled "Days of Study and Reflection" comprising three sessions on 13 and 14 November 1982, 4 and 5 December 1982, 5 and 6 February 1983, on "The Purpose of Rosicrucian initiation". The seminars took place in the cultural center of AMORC, rue Saint-Martin, in Paris. 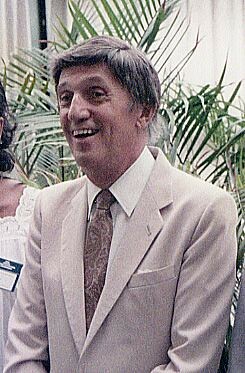 In January 1983, he made ​​his last trip to Haiti, as Supreme Legate, accompanied by his wife, to celebrate, along with over 300 members, the 30th anniversary of the Martinez Pasqually Lodge. At Athens, Raymond Bernard attended in his capacity of Supreme Legate. Raymond Bernard presented a seminar in Avignon. Raymond Bernard attended the World Convention of AMORC in Copenhagen in his capacity as Supreme Legate. He hosted two "Days of Study and Reflection" on the theme "The Rosicrucian approach to the problems of life, liberty, disease, death, and civilization". These seminars took place at the Cultural Center of AMORC, in Paris on December 1 and 2. From 29th to 31st March. 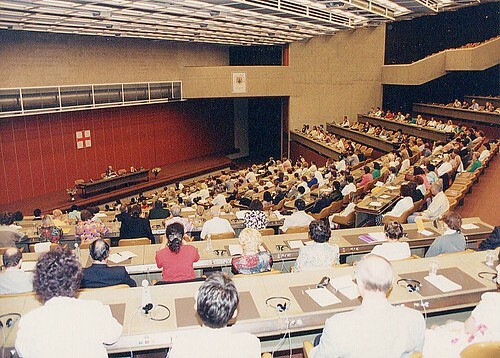 Convention for the French-speaking countries. In this broadcast, Raymond Bernard, interviewed by African presenters, talked about African traditions, the role of traditional Western organizations in the African continent. He also talked about his meetings in Africa; about society, sects; brotherhood, etc.. 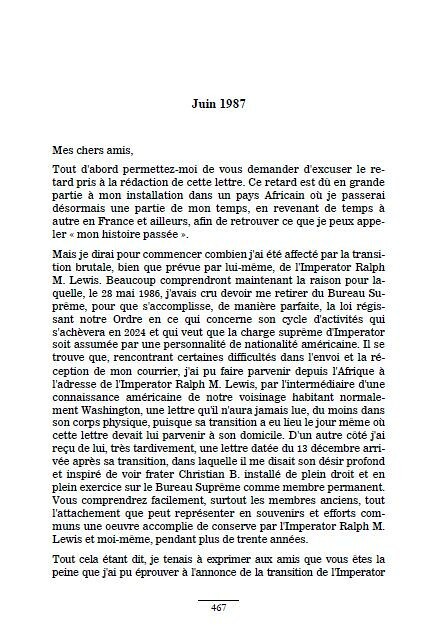 Extract from Letters from Nowhere (Zotheca Publishing, Montreal, new edition, 2012): the letter, dated June 1987, in which he explained the reasons for his withdrawal. It was held from July 24 to 26 at the Marriott Hotel (Times Square). The theme was that of "Freedom and Unity", and many of the Supreme Grand Lodge officers and Grand Masters presented various aspects. On July 25, Raymond Bernard delivered a particular message during a ritual that he conducted. On the occasion of a Seminar in Geneva, Raymond Bernard announced his official retirement from Rosicrucian activities for health reasons. Naturally he remained a member of AMORC, then numbering nearly 40,000 members. Death of Ralph M. Lewis. Election of Gary Stewart, the third Imperator of AMORC. Raymond Bernard was appointed to be his personal consultant. Raymond Bernard and Yvonne moved to Yaounde, Cameroon. He wrote most of the writings that formed the basis for the establishment of the future CIRCES. He had already written a number of documents laying the foundations of CIRCES while in Yaounde. 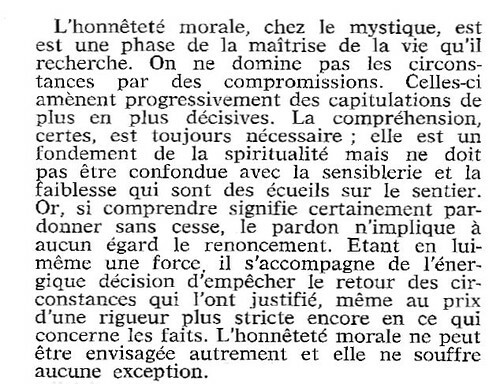 In particular, he wrote a "Moral Code" which formed the spiritual foundation of CIRCES, the movement which he announced in January in" Le Monde Inconnu". 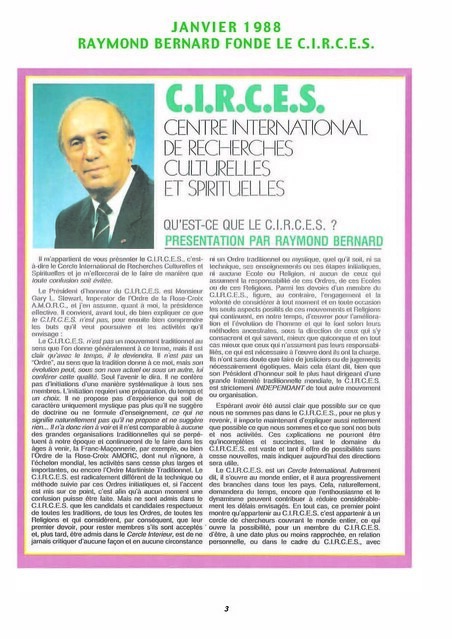 Raymond Bernard founded the CIRCES (International Circle of Cultural and Spiritual Research) by an announcement in the monthly "Le Monde Inconnu". (The unknown world) The beginning of its activities was on 19th February 1988. 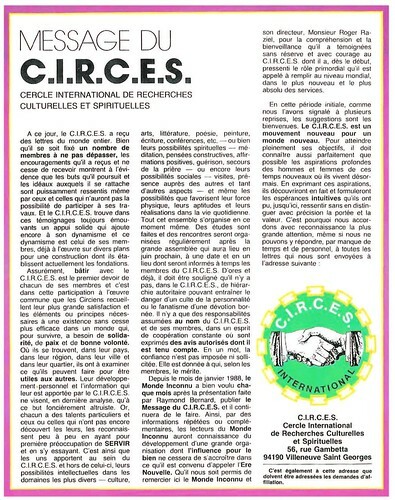 Presentation by Raymond Bernard about CIRCES (International Circle for Cultural and Spiritual Research), a movement based on action in the world, whose activities began formally February 19th, 1988. 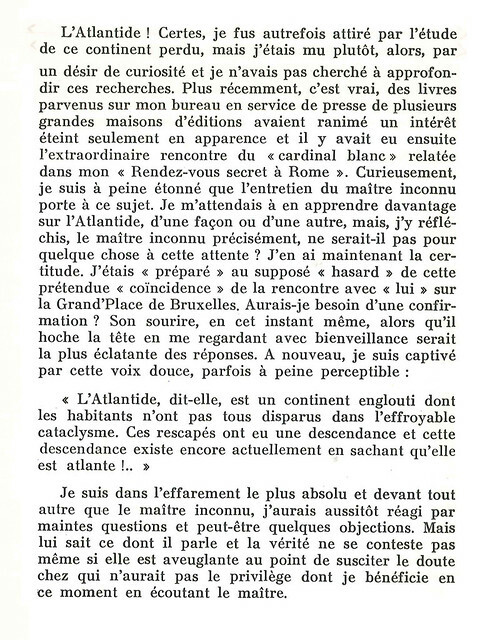 Two-page insert in Le Monde Inconnu (The Unknown World) No. 90, January 1988. This section entitled "Message from CIRCES" provided monthly new information about the movement..
February 19th marked the beginning of the activities of CIRCES. Messages began to be sent monthly to members, with practical guidance about how to form workshops and commissions. 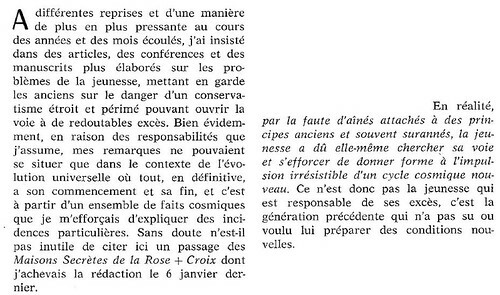 Since the announcement in le Monde Inconnu, January 88, hundreds of members had already been registered. 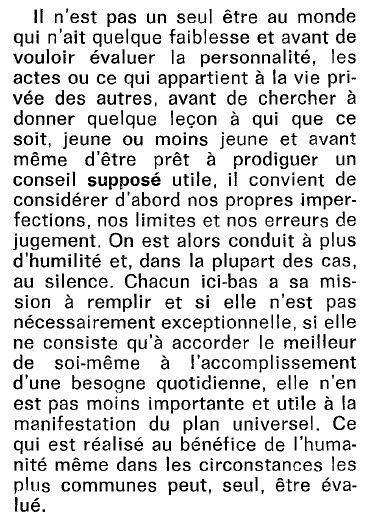 In the February issue of le Monde Inconnu (No. 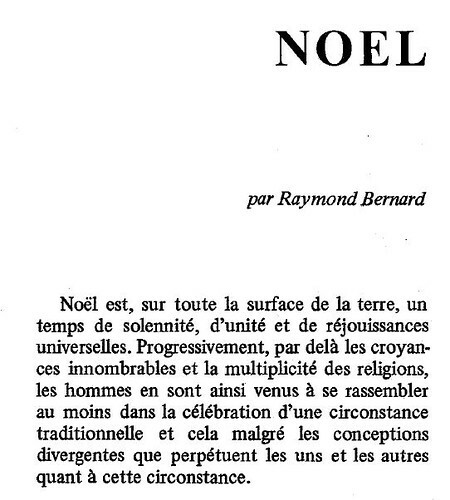 91), Raymond Bernard thanked all those who had already responded to the call of CIRCES in the January issue. The Convention of AMORC at Lama-Kara, Togo was honoured by his presence; this would be his last appearance at an AMORC Convention . "On what is and what is not the CIRCES"
Details of the movement. He openly introduced the notion of the builder and of personal commitment. 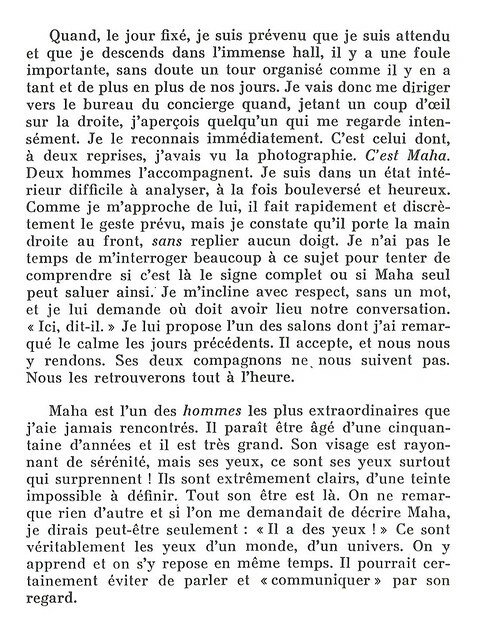 Le Monde Inconnu No. 92, March 1988, one page. Entitled "Message from CIRCES": He stressed the notions of the builder; of intuitive hope; of a limited membership. Thanks to R. Raziel editor. 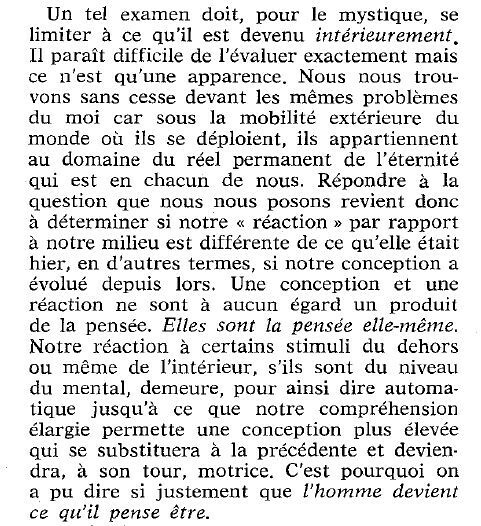 Le Monde Inconnu No. 93, April 1988, one page. He appointed officials (designated Chancellors) to Haiti, Congo Brazzaville, the Nordic countries. Under the heading "Message from CIRCES" an article on the objectives and methodology; on the membership development as builders and researchers. CIRCES is not a teaching organisation. 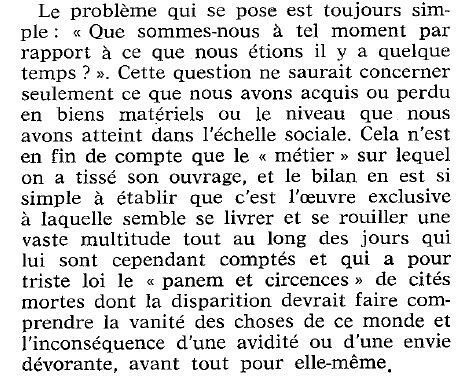 Le Monde Inconnu, No. 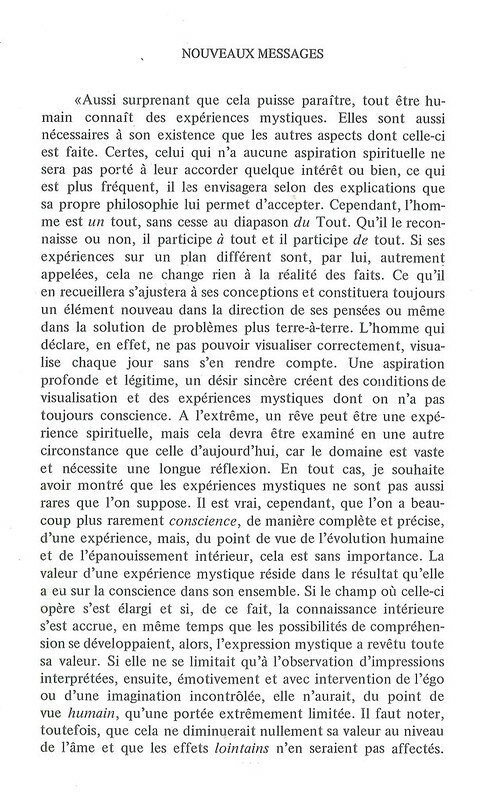 94, May 1988, one page. Heading "Message from CIRCES": Announcement of the Plenary Constituting Meeting. He reminded people that this is not a mass movement, and is based on the work of volunteers. Le Monde Inconnu, No. 95, June 1988, one page. 700 members present. Presentation of the complete organization of CIRCES - both exterior and interior. The principle responsible officers introduced themselves, including ten Chancellors representing their countries. Several committees devoted to many areas of research were organized. "We are not like any other school ... we are an open movement, of chivalric inspiration, but where, on the inside, one advances in a slow progressive manner." 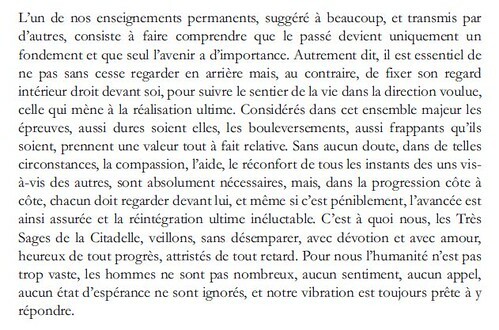 Entitled "Message from CIRCES" he gave the Minutes of the first plenary session (600 delegates); announced the Conference in Avignon on 24th-25th September. Le Monde Inconnu, No. 96, July-August 1988, one page. 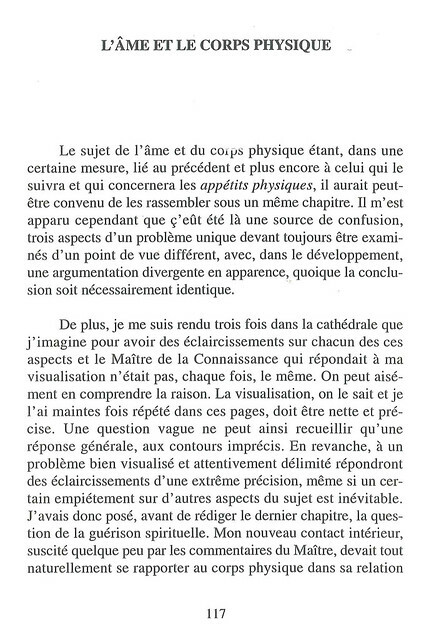 A long interview of Raymond Bernard by Erik Pigani. Le Monde Inconnu, No. 96, July-August 1988, three pages. Positioning and values ​​(tolerance, respect). 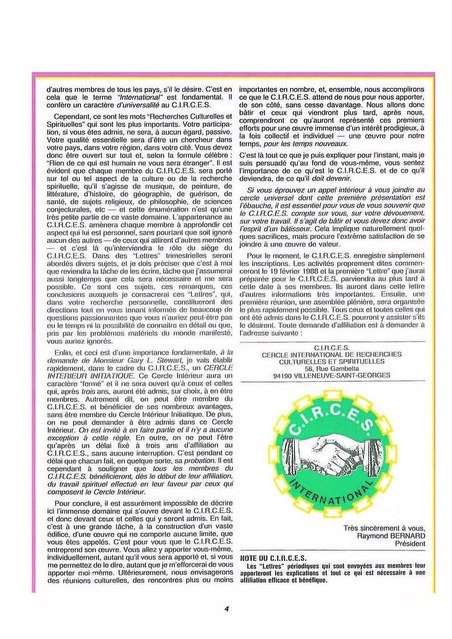 Under the heading "Message from CIRCES", an article, returning to and supplementing the Plenary Assembly of June, about the organization of CIRCES, about the values of tolerance and understanding. Le Monde Inconnu, No. 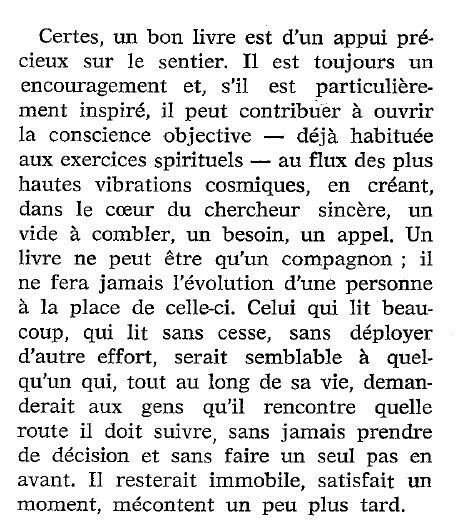 97, September 1988, one page. September 24th and 25th. He established the Sovereign Order of the Initiatic Temple (OSTI), in the Papal Palace in Avignon, at the first CIRCES Symposium, by conducting 45 initiations. 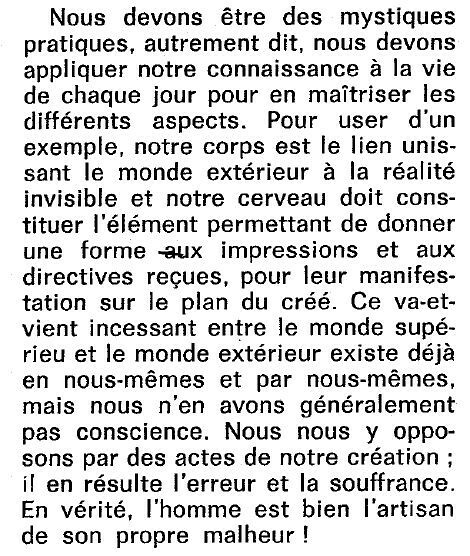 "On September 25th 1988, was the manifestation of a particular expression of the Tradition : OSTI, the achievement of an inception phase of 219 days since February 19th, 1988, the creation date of CIRCES - They are only the visible part of a process that began long before" . 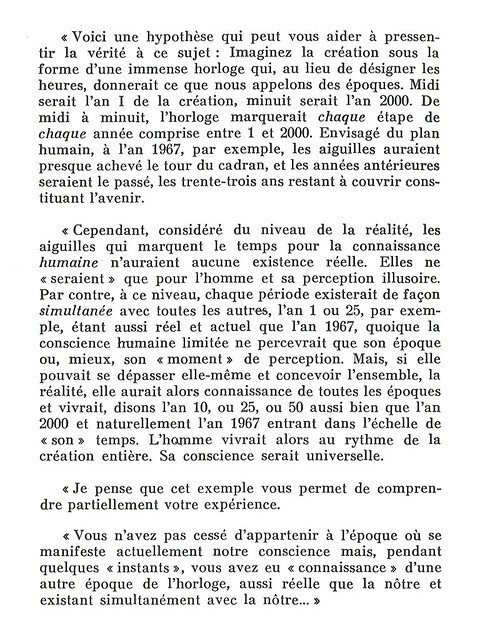 The first part of a symbolic Mystery play that would form a "SublimeTétralogie" over the following Symposia in Avignon was presented. The Grail would be one of their principle symbols. He appointed an official for Switzerland. Each country where CIRCES is active is named Chancellery . It is run by a" Chancellor"
Heading "Message from CIRCES" About the rapid development of the CIRCES and organization put in place internationally, creating committees with their subjects. Le Monde Inconnu, No. 98, October 1988, one page. He nominiated officers for Brazil and Portugal. 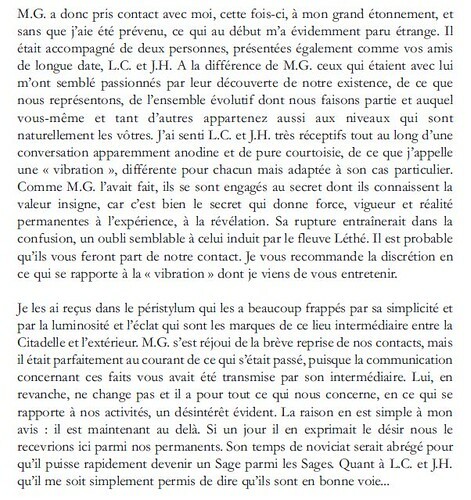 Article under the heading "Message from CIRCES" : a very significant focus was given, namely :on the genesis, the approach of the member, on the independence ot the organisation, on some hostile reactions, etc.. Le Monde Inconnu, No. 99, November 1988, three pages. 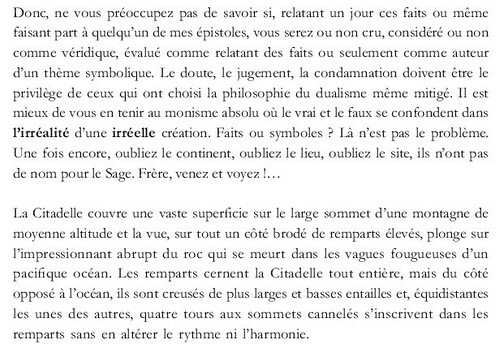 Article: "Message from CIRCES" about the existence of the Moral Code; respect for religions: friendship, freedom; Installation of the permanent headquarters. Le Monde Inconnu, No. 100, December 1988, two pages. He nominated officers for Zaire, Israel, Cyprus. Nominated a Chancellor for Luxembourg. 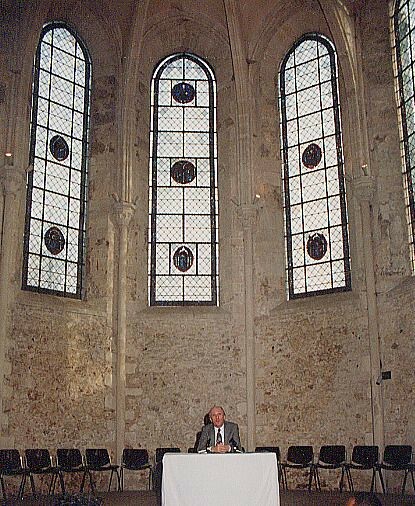 Plenary Assembly at the Sorbonne in the Richelieu amphitheater; RB and several other speakers on "The Chivalry of the New Age"; "Knowledge of Science and Evolution of Consciousness"; "The art of living in the twenty-first century"; "The Grail cycle and Magical Genealogies"; "The Presence of Pythagoras in the Age of Aquarius"; " Music Through the Ages". No. 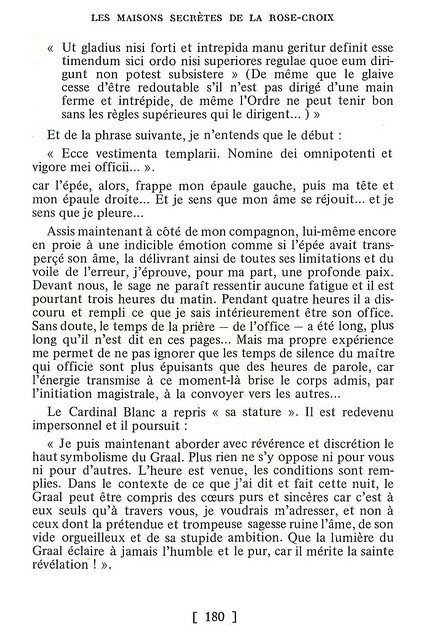 104, April 89, one page. 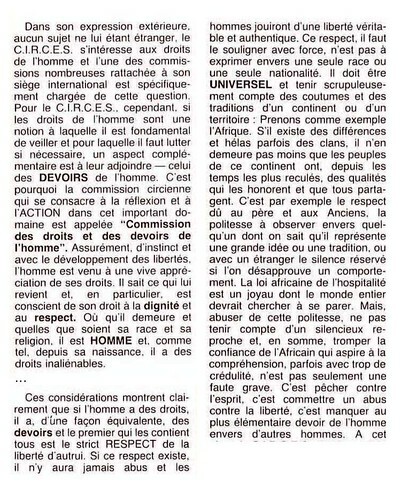 Article "Message from CIRCES" : Further development of the theme of Tolerance. Le Monde Inconnu, No. 105, May 89, one page. He nominated a Chancellor for the USA (Onslow Wilson). In the Descartes Amphitheatre of the Sorbonne. More than 600 members attended this first Cenacle. Various subjects about the world were treated by several speakers: "Humanity at the dawn of 3rd Millennium"; "The art of living in the 21st century"; "Health within a universal vision of man"; "Chivalry at the dawn of 3rd Millennium"; "Revolutionary Perspectives on Rights and Duties of Man"; "CIRCES: the coming of a spiritual age"; "Knowledge of science and evolution of consciousness" . He nominated a Chancellor for Columbia. At the Palais des Papes 23rd and 24th September, 1989. The second part of the "Sublime Tetralogie" was presented. He also spoke of the "mass of symbols that the ceremony includes and which have their own importance." The value of humility. In the monthly bulletin No. 20 of CIRCES, he responded to questions about the TMO. He wrote, "The Traditional Martinist Order is one of the most valuable traditions of our time. Moreover, it was to Raymond Bernard himself, that the mission to restore the Order in France had been assigned. 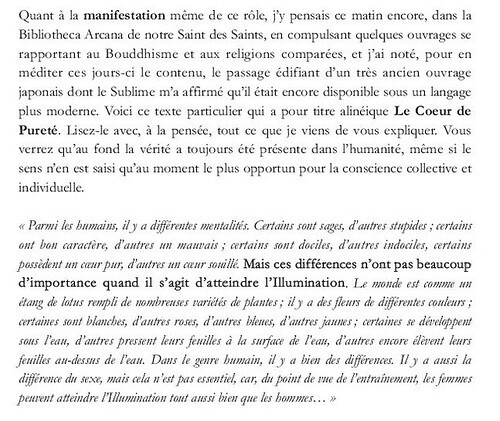 The Order, as it exists in France, is absolutely regular in terms of initiation and tradition." He added that "He always regretted very much that the Martinist work in the United States, was not to be recognized by other Martinist movements in the world. In that country, only Dr. Harvey Spencer Lewis, Ralph M. Lewis, James R. Whitcomb and Duane Jess Freeman were initiated in an incontestably regular basis." 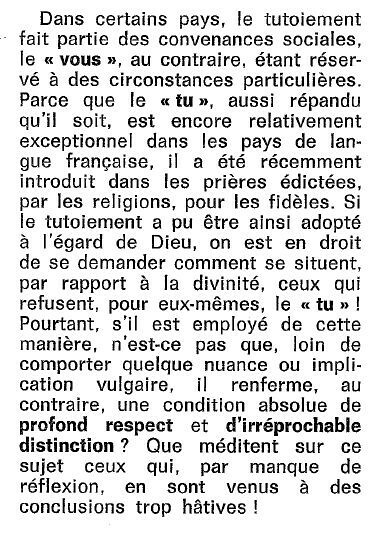 This clarification was made ​​following a new spiritual direction of the TMO at the initiative of its French officials. 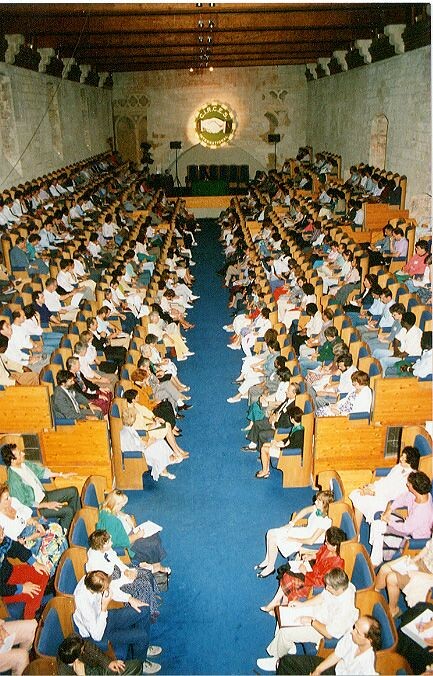 On January 7th, 1990 because of the number of participants (limited to 400) in the chapel of the Templars at La Villedieu - Yvelines. Each year, at a date close to the Epiphany, he hosted an international plenary meeting. 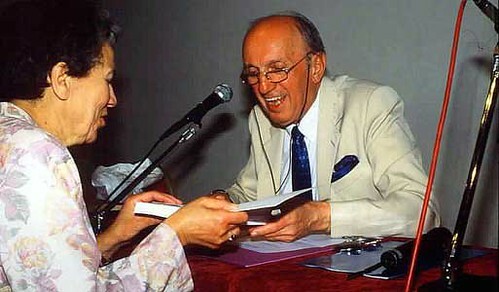 The author wrote "The Letters from Nowhere" to reveal aspects of his life which, from 1977 to 1988, took him on a trip to India to investigate oriental wisdom, allowed him to inquire into the memory of esoteric movements of the 20th century and to meet with Kamal Jumblatt and the Druze and his personal archives. The book was written in the easy and familiar style of a private correspondence. He used that approach because he wanted to release them from the time and space to which they bore witness so that they might reveal something more about human nature in its quest for spirituality in everyday life. These letters also dealt with the Primordial Tradition, life and death, prayer, meditation, consciousness, divination, psychic abilities and spiritual practices. 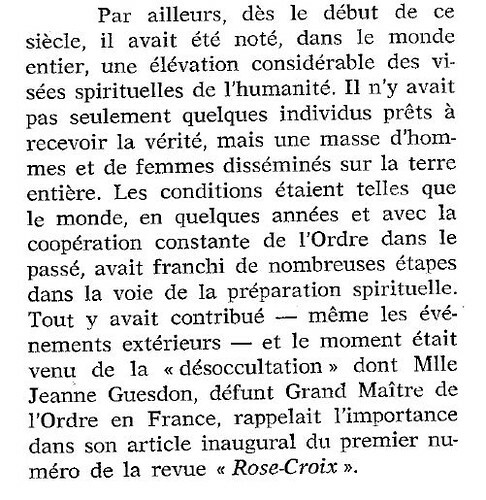 Also mentioned are the major players within the Tradition (the Rosicrucians, Freemasonry, Martinism) - Stanislas de Gaita, Josephin Peladan, Jeanne Guesdon, H.S. Lewis, Papus - as well as unusual and providential encounters which enliven this immersion in Eastern cultures (Hinduism, Buddhism, Sikhism). From 24/03 to 01/04/1990. Within the framework of CIRCES, he organized and led the first trip to Portugal with nearly 50 participants, following in the footsteps of the Templars. He was to lead such voyages almost every year until 1997. From 18th to 20th May 90 - African Traditional Medicine. Activities of the Inner CIRCES also took place and continued in Lome, Togo. 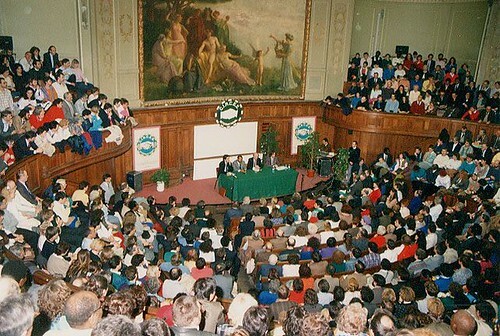 Paris, the Sorbonne, 700 members were present. He regretted not being able to receive a greater number of participants. During the months of July and August, he wrote several messages for the OSATA, and completed those proposed to him from experiments designed to develop a method of initiatic sensitivity and personal awakening, which addressed all sorts of things for personal reflection. This OSATA is completely different from what he had created for Africa (see August 10, 1971). The official launch was planned for October 1990. At the Palais des Papes on 22nd and 23rd September, 1990. Third installment of the Sublime Tetralogie. Values ​​and influence of the Pythagorean School. Knowledge of symbols, of image and number. Activation of the Pythagorean component. 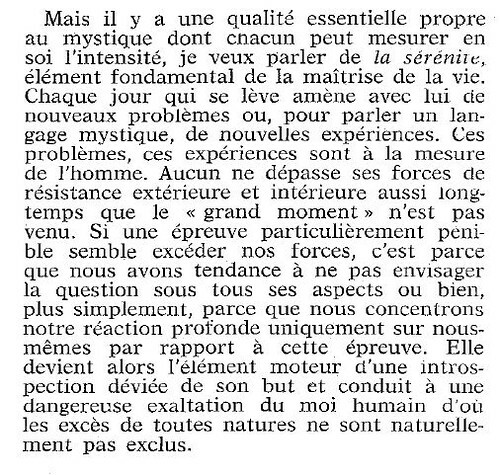 "Without the mystery, life would be unbreathable". He organised and led a week-long initiatic journey in the Cathar region. An announcement was made to the members of CIRCES about the establishment of OSATA (Sovereign Order of Ancient Traditions Arcanes), on January 19th, 1991; this was an approach based on contact through correspondence. With the backing of Jean-Pierre Bayard and Maurice Attar, he was admitted within the GLF (Grand Lodge of France). His previous initiations were recognized and he integrated with the Trinitarians. Plenary Convent to celebrate the Feast of Epiphany. From 15 th to 20th May 91: Theme "The traditional authentic values of Africa within a modern development of the continent", followed by activities of the Inner aspect of CIRCES. He nominated a Chancellor for Australia. He wrote the introduction to this narrative, inserted in an internal publication of CIRCES, distributed by subscription. This story would take the form of a series of letters between a character named Gunther and the writer. 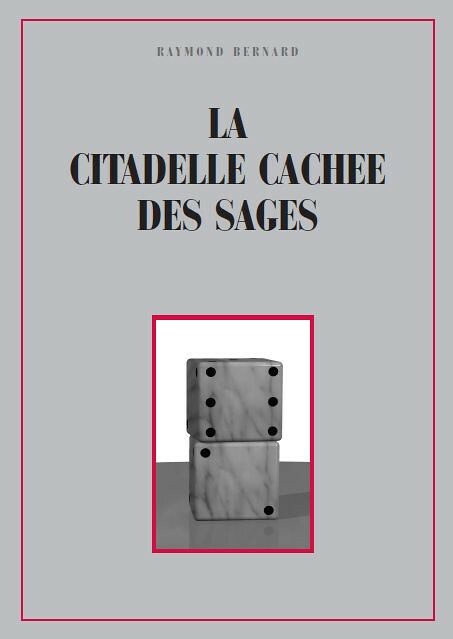 At the Palais des Papes, 21st and 22nd September: The 4th installment of the Sublime Tetralogie. Two guest speakers: JP Bayard and Peter Roche de Coppens. "The Wisdom of the Soul of the Self is Being and Being is Love" ... "Developing a Love of the Truth of Wisdom". Besides a reorganization and the introduction of the elective process for officials, he decided to stop any form of teaching within the CIRCES and stopped sending any form of regular communication (this applied to CIRCES, the OSATA ( see 19/10/90) and the OSTI, thus favouring only oral communication and collegiate work. The Articles were amended to that effect. 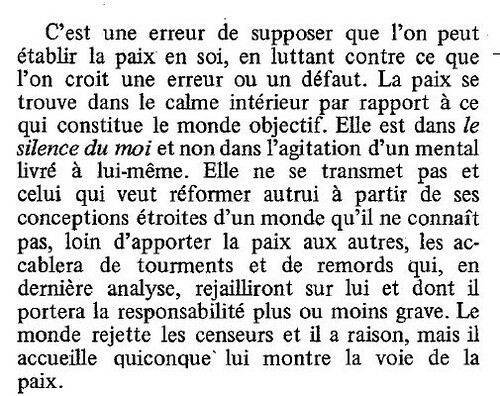 Each country would henceforth operate on the same principles, but was independent and accountable for its actions. This development would pose a problem for the U.S.A.
On 18th/19th/20th October. He was the Guest of Honour. Conference on "The sublime teaching of the esoteric Tarot". 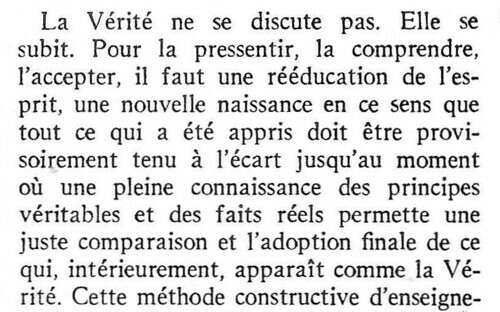 Also, Raymond Bernard held a seminar where he examined the activities of CIRCES. 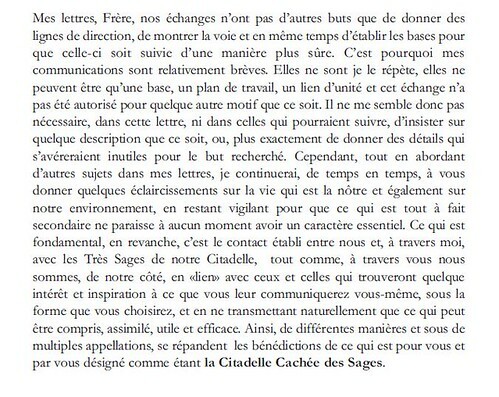 Preparation of the First Epistle of the Secret Citadelle of the Sages, distributed on 25th April to subscribers. The restructuring announced on 25th September, 1991 had been accepted and applied in all countries. A letter from the Chancellor for the U.S.A., however, reported difficulties in applying the new rules (especially the participation fee for the documents sent from the International Headquarters). This letter sets out more specifically that the American association cannot pay the participation fee. In addition the American culture required him not to implement fully the new provisions. 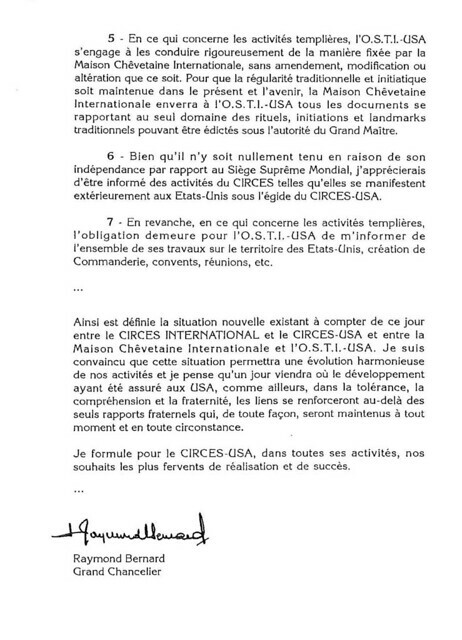 CIRCES breaks with the U.S.A.
Because of the different direction the Chancellor in the USA wished to follow, Raymond Bernard decided, after consultation with the Board, to suspend all administrative links between CIRCES USA and the MCI, which allowed the Chancellor to develop his own project. The only requirement was that the Interior CIRCES work (OSTI) must follow the rules and guidelines of the MCI. However, the instructions given in the following years by Raymond Bernard on the Templar Tradition were not obeyed and a definitive break was to be ratified in 2006. This last Colloque was held on 12th and 13th September. Topics included : "The Initiate in the New World." 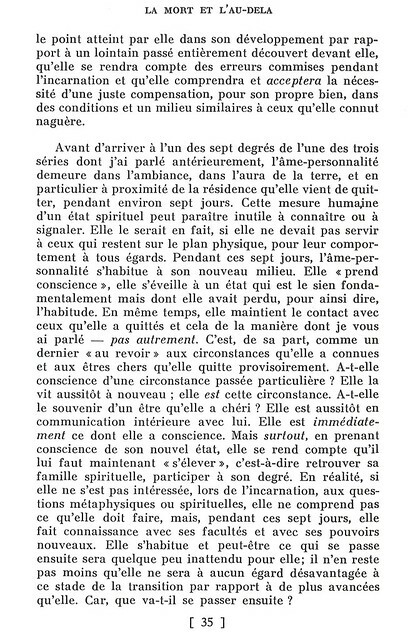 The 5th esoteric point. The extreme importance of forgiveness. "By acting and not just looking, a Knight Templar has an exceptional task to accomplish. "..." The Mission which is ours: humility in understanding that even if we were nothing in ourselves, we become a unit for service in the world. "..." Gift to others in Service ... "
Production of the Second Epistle, reserved for members of CIRCES. Production of the Third Epistle. From 28th May to 6th June. 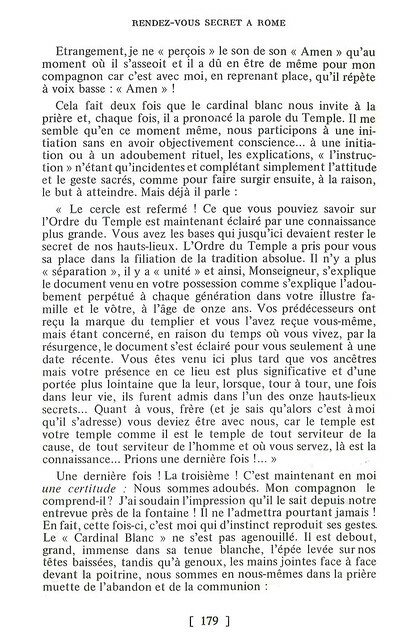 The first Rule of the Temple, written by Raymond Bernard, the Seneschal and the Marshal, was formally decreed May 30, 1993 at Tomar, in the Convent of Christ. This was the second seminar of the OSTI: The work included spiritual reflections taking the form of questions and answers, in the spirit of the oral tradition that the Temple (OSTI) in its modern expression is also mandated to vitalize. Within the framework of Templar activities in the U.S.A, he responded to the invitation made ​​to him. Fusion of the OSTI and CIRCES under the name OSTI. Production of the Fourth Epistle. The CIRCES became the International Committee - the cultural, scientific, humanitarian and charitable arm of the OSTI. The recorded sound extract clarified the objective of CIRCES and the object of the OSTI in this next stage. Production of the Fifth Epistle. He autographed his book "The Cosmic Cathedral" (Dervy) at the bookstore La Hache Solaire in Paris. He conducted an initiation ceremony in the crypt at Chartres Cathedral. From 28th May to 5th June. The seminar included spiritual work and an exchange in the modern oral form of the Tradition within OSTI. Plenary Convent to celebrate the Feast of Epiphany. There was an emphasis on the question of Silence. The Grand Commander, Onslow Wilson, informed the MCI that Templar operations in the USA would, in future, operate under the name Templar Research Institute (TRI), legally remaining CIRCES International. The notion of education, deleted and now forbidden since September 25, 1991 for all countries was, however, maintained by that Grand Commander. From 25th May to 2nd June. At Tomar, he installed Yves Jayet as Deputy Grand Master. He wrote the last three Epistles, the sixth, seventh and eighth. The eighth Epistle was the conclusion of the series. These were all distributed in August-September to subscribers. 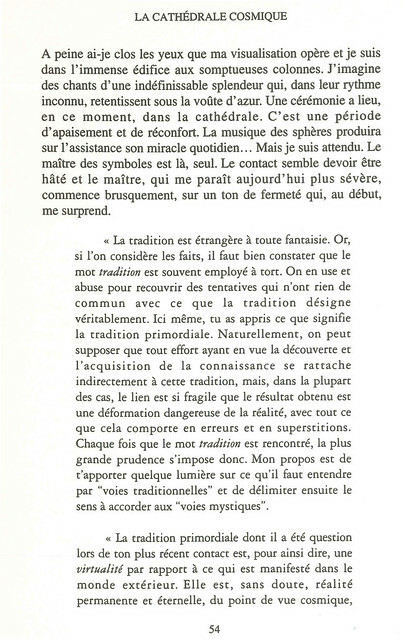 Serge Caillet, historian of the occult, interviewed Raymond Bernard to talk about the Order of the Temple This interview - entirely recorded - took place in Paris at the headquarters of the OSTI, and was published in The restored Order of the temple , by Dervy, in 1997, forming chapter VIII. This very informative and accurate book (some events on this site are drawn from it ), presents a detailed history of the renovated Order of the Temple on the basis of archives, records and other personal interviews. 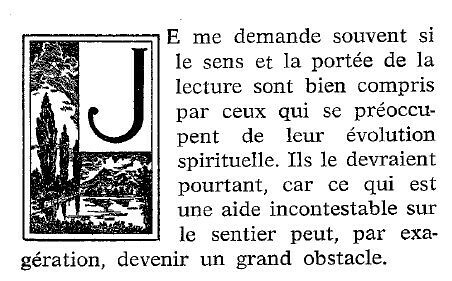 Serge Caillet, historian of the occult, interviewed Raymond Bernard to talk about the Order of the Temple This interview - which was recorded - took place in Paris at the headquarters of the OSTI. It was not published as such but was included in the book The restored Order of the temple (Dervy, 1997). See also the event of December 7, 1996. Interview "My whole life was preordained"
While Grand Master of the Sovereign Order of the Initiatic Temple, he agreed to meet Theodore J. Nottingham for an interview in a magazine devoted to the Tradition. Early in the interview, he said with a laugh that he would, for the occasion, use the name Valaire de Gramscott, his daimon of the day. The meeting took place in the heart of Paris near the Place de la Concorde. He confided later, being both surprised and amused, that the pseudonym had been spontaneously inspired by the name of Gramsci (specifically Va Gramsci, one of the streets of his Roman journey). From 24th May to 1st June. In Villeneuve-Saint-Georges, there was a Special Convent where he was the special guest of honor. It was his last participation in a meeting of the OSTI and the CIRCES, having retired in June 1997. Private video interview: Prayer, life, death. He gave a private video interview, at his home, where he talked about the Tradition, Africa, prayer, etc. 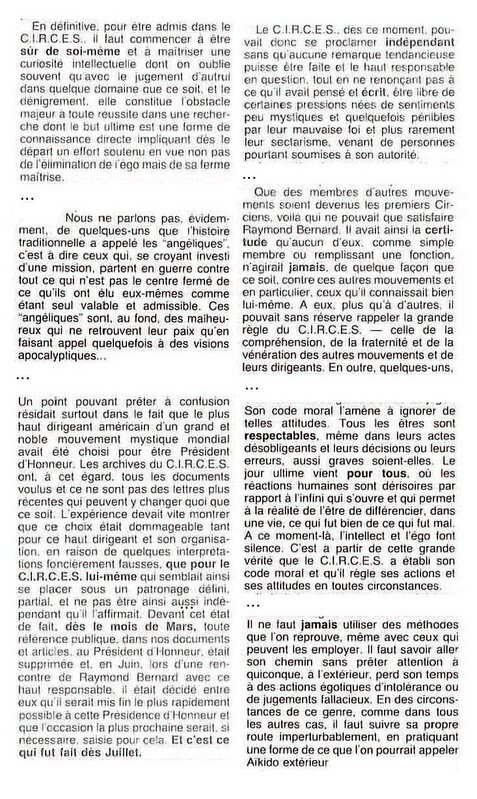 As a journalist, Jean-Paul Guillaume has conducted three interviews to recount major periods in Raymond Bernard's life, in particular his first contact with mysticism, age 17 then, how he had developed AMORC since 1956 and finally his motivation to create CIRCES in 1988. 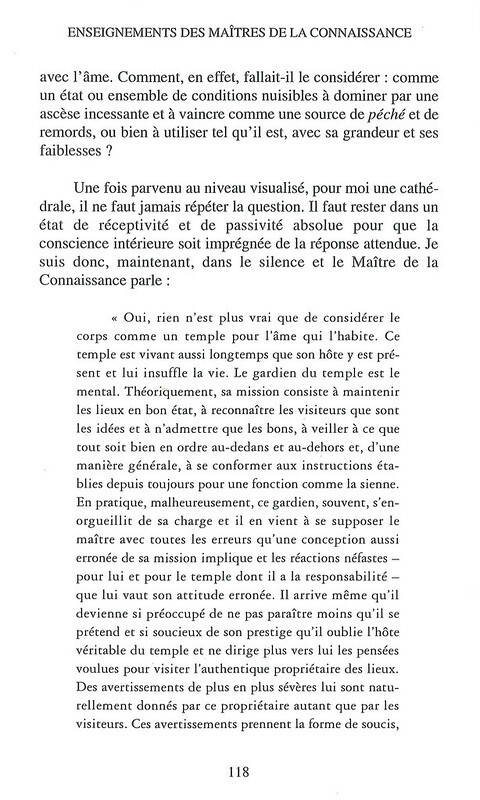 Jean-Paul Guillaume gave us his authorization to edit and put on line the recordings made at Villeneuve Saint-Georges on the ocasion of three appointments in the year 2000.The four proposed excerpts are from one of these interviews. 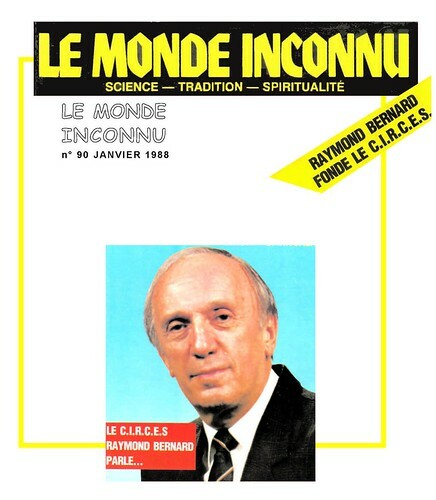 In March 2001, Friends of Raymond Bernard created the association ARB (les Amis de Raymond Bernard) to collect the key aspects of the life and work of Raymond Bernard in any form whatsoever : writings, testimonies, photographs, audio and video recordings, letters, ans so on. A thorough research was initially conducted concerning Templar movements, as great confusion were found in newspaper articles that discussed this topic. Clarification of the position of Raymond Bernard in the Templar tradition. 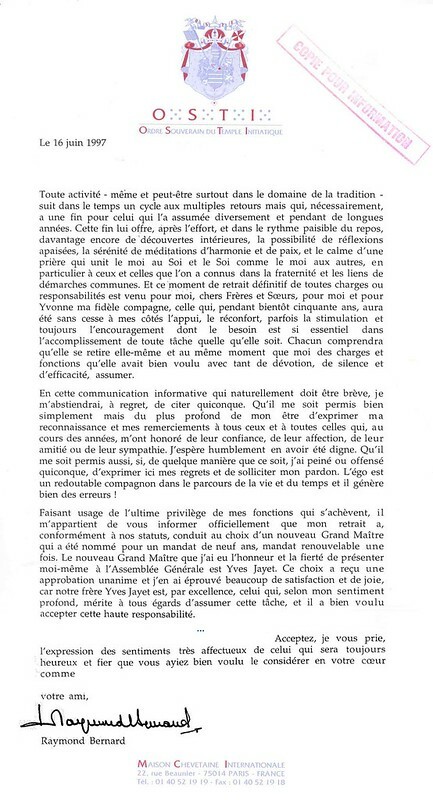 A letter from his successor, Y Jayet, concerning the Templar movements, the OSTI and Raymond Bernard. 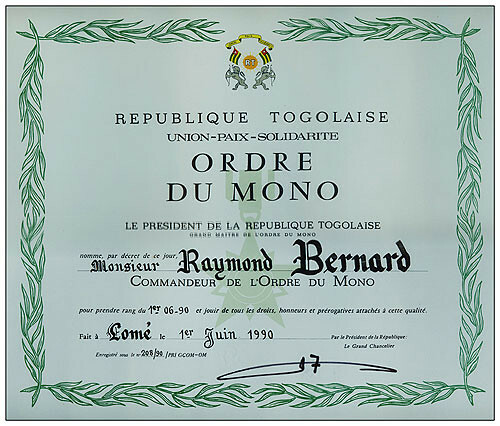 The press took the tragic end of the OTS and sometimes hinted at an influence that Raymond Bernard might have had on this Order. Because the investigation and pending proceedings took several years to demonstrate that this was not the case, it had been thought necessary, in the meantime, to make a detailed, in-depth, documentary about the Templar movements. This is why the association ARB (the "Friends of Raymond Bernard") was created. 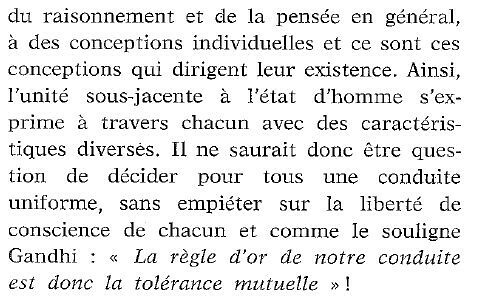 He tells about his initiatic filiation and how he had developed Martinism in France(OMT) since the 60s.He recalls his contacts with R.Ambelain,P Ebcausse,M.Laperruque..He finally reminds the motto"The largest tolerance in the strictest independence. "This interview was given on March 7th 2003 during a stay in a spa town in Switzerland. 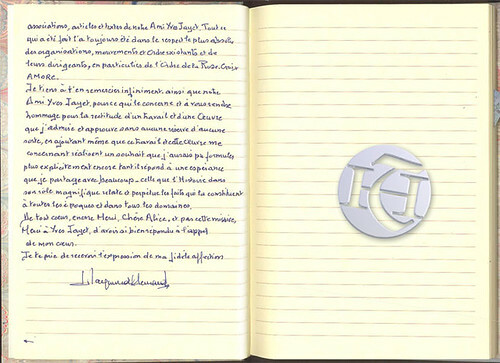 Through this letter, he expressed his wish that a site be created to give details about his life and his work. He entrusted this work to Alice Ouzounian, a longtime friend. The site is http://www.tradition-mystique.net and it gives access to several of his works in their original text. 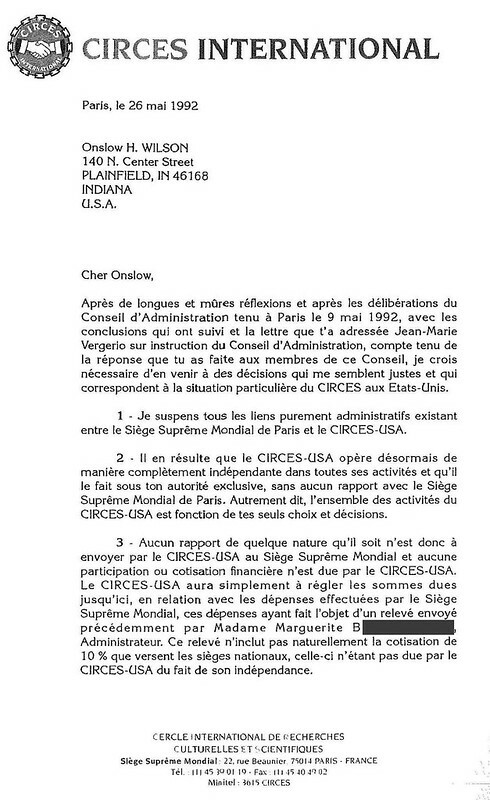 The confusion generated by the integration of a Martinist activity during an OSTI symposium in the USA was the reason for a request by the MCI (the International Headquarters) that the USA organisation clarify their position because the conditions defined in the letter of 26 May 1992 were no longer being followed . Death of Raymond Bernard. His funeral took place at Valenton (France). He had made ​​a will specifying the structure of his cremation ceremony, ensuring that no physical evidence remained. Thus, his ashes were scattered among many others in the surrounding lawn in front of some friends and family. 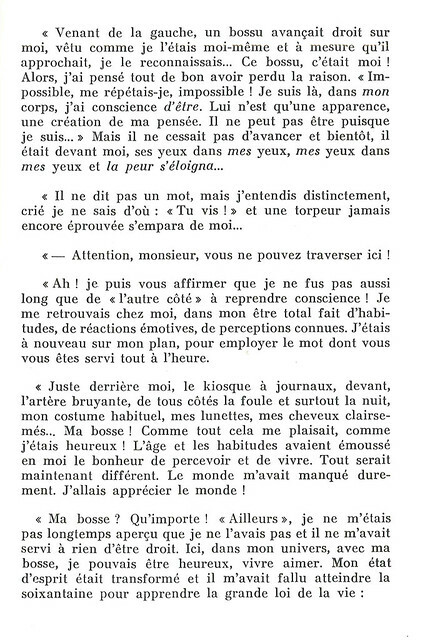 Excerpts from a tribute paid to Raymond Bernard, addressed to those who followed the Templar path that he had established. These exemplified the notions that he cherished: the Epiphany, the void, the work of inspiration, the lack of teachings, action - and his desire to leave no traces other than his work. The former Grand Commandery of the USA had become irregular and committed to developing a path different from that established by Raymond Bernard. The MCI (International Headquarters) therefore no longer recognized that structure and prepared the formation of a new regular Grand Commandery. To restore the original project that Raymond Bernard had wished for the U.S., a regular Grand Commandery was reconstituted, with two active houses, one in Miami (which has always remained regular), the other being created in New York. A new Grand Commander was installed. 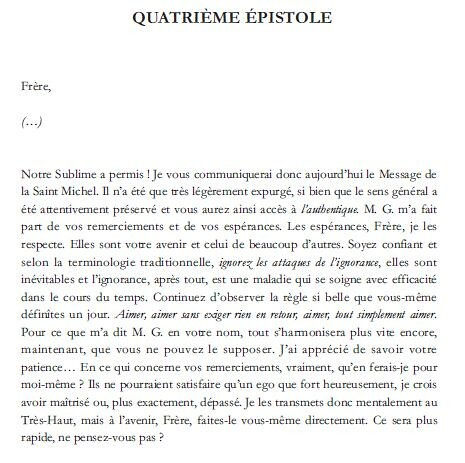 New edition of The Letters from Nowhere : "Lettres de nulle part"
New expanded edition including 10 autobiographical letters that were not included in the 1990 edition, as well as the testimony of Jean-Marc (he accompanied Raymond Bernard in India, 1977). 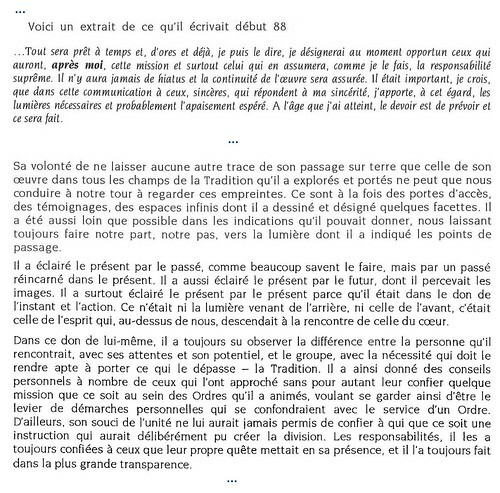 Publishing Zotheca, Montreal, 2012, 520 p.
Available in paper and e-book format for iPad, Kobo and Kindle. Launch of the website "Biography"
The site went live online on May 19th with 316 events, in French and English. It will continue to be enriched with new events and media through research and contributions. "What is Martinism? 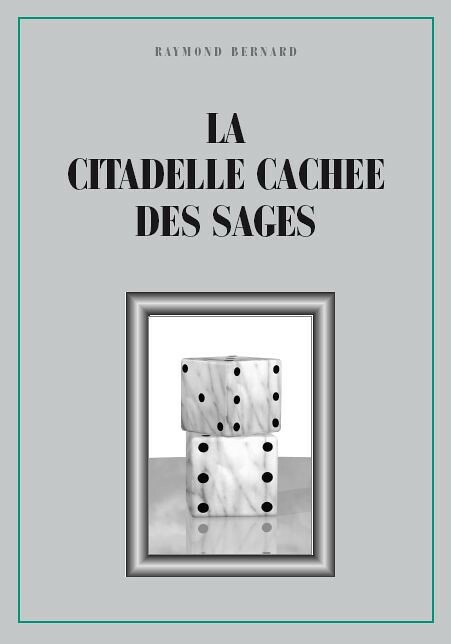 Who were Martines de Pasqually, Louis-Claude de Saint-Martin (The Unknown Philosopher) and Jean-Baptiste Willermoz? What was their teaching and what were their schools? Who are their heirs? 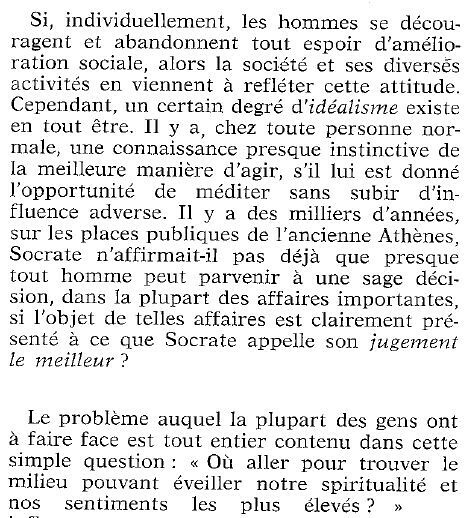 What is the Martinist Order founded by Gérard Encausse (Papus) during the Belle Epoque and what are the initiatic societies which may claim to have their roots in Martinism? 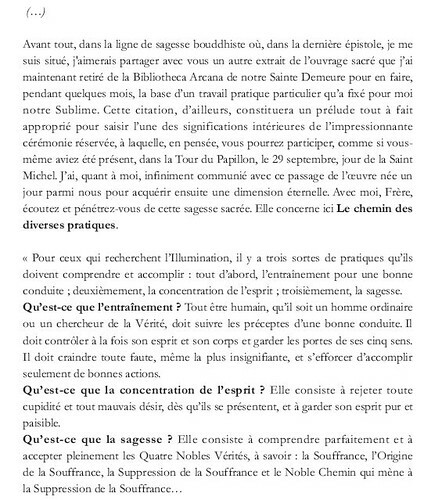 Accepting willingly to answer Xavier Cuvelier-Roy's relevant questions in six informal interviews, Serge Caillet opens the great files of Martinism one by one: The Enlightment, the Belle Epoque of occultism, Papus's epigones, clandestine activities and the post war, years1960-1980, Martinism at the Age of Aquarius. 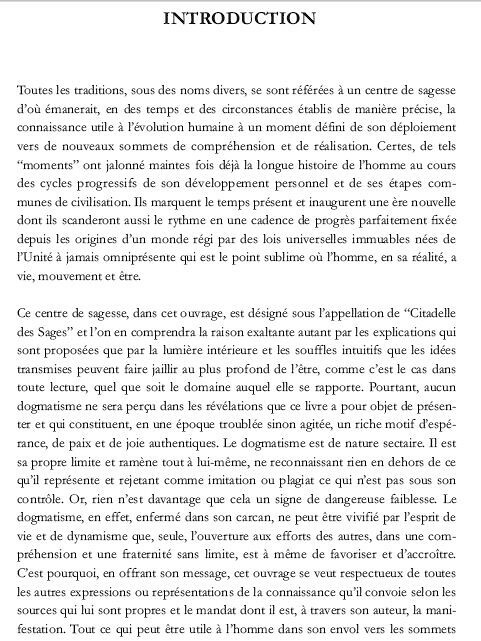 On the way, Serge Caillet and Xavier Cuvelier-Roy can address as well issues related to Martinism in all its forms and invite us to meet many people, that is these "men of desire" who have made the history of Martinism since the XVIII th century. In the second part of the book, "Martinist Annals, from their origins up to the present day" identify key events in the history of Martinism. Finally, a biografic index gives amateurs a working tool and a wealth of references unparalleled. France is also the venue of the "Maison Chêvetaine Internationale" (MCI - the International Headquarters), that was established in 1988 by Raymond Bernard. It has several temples, offices, meeting rooms, a library of 9000 books. The coordination of CIRCES is organised from there. Activities are conducted in Bruxelles. Activities are conducted near to Estoril. The activities of OSTI are conducted in Bien. Regular collections of medical material and spectacles are made for transmission to India and Africa. Activities are conducted in the Milan region. Activities are conducted in Nicosia and at Limassol, in Greek and English. Ateliers (workshops) which are open to the public are also conducted. Activities are centred on Bristol. Activities are conducted at Cotonou. Activities are conducted at Lomé, Togoville and Kara. Activities are conducted in Dakar. CIRCES projects are in preparation in Keur Moussa (packing plants). Activities are conducted in Abidjan. Projects are underway in the province of Toumodi (electrification, home school teacher). Activities are conducted in Port-au-Prince. Current projects are on health grounds (cholera), access to clean water, school supplies (books), shelter (tents). Activities are conducted in Panama City. Activities are conducted at Antananarivo. Activities are conducted at Brazzaville and at Pointe Noire. Activities are conducted at Kinshasa. Activities are conducted at Rio and at Sao Paulo. Activities are conducted at Quito. Activities are conducted at Bogota. Activities are conducted at Montréal. A regular OSTI Grand Commandery was restored in 2008 following the divergence from the first team which began in 1992 and was finalised in 2006. 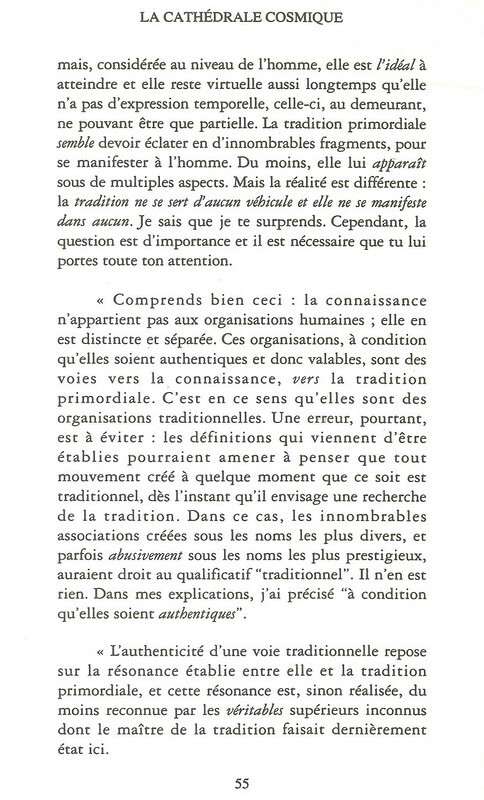 Subsequently, the leader of that group introduced himself as the successor to Raymond Bernard, but having no legitimacy other than that of a trademark registration of emblems and names made ​​by his predecessor. He had not received instructions to do so, each Grand Commandery only having the right to use them as a sign of their regularity. 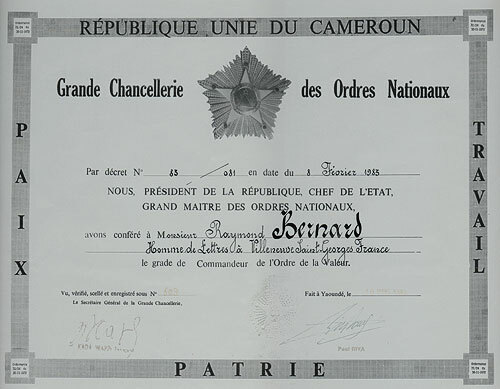 The old team did not want to follow the rules established by Raymond Bernard during his tenure from 1988 to 1997, rules that apply to all the Grand Commanderies. Finally there was a breakdown on all levels (ritualistic, traditional, operational). From 1997 to 2006, exchanges and discussions confirmed this desire for autonomy on the part of officials of the time. There is presently a possible confusion by using the same words, but with different meanings and using certain similar attributes that are used for other purposes. 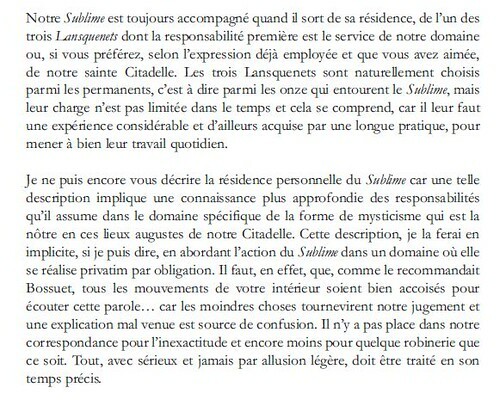 The old team is still using, illegitimately, the titles, emblems and functions of CIRCES and OSTI, in particular the terms usurping MCI (Maison Chêvetaine Internationale) and Grand Master (who appears in photographs wearing the decor of a Grand Commander). Commanderies operate in New York and Miami. The Commandery of Miami, which has always been regular, operates in French and English.